Is it the ultimate model, does it offer the ultimate flight dynamics and so on. Many questions and thoughts if this is the A320 we’re all waiting for. I was already afraid for it that it would become a massive review, and yes, it has become. To keep the overview of such a massive review, we’ve decided to include a table of contents. Oh yes, I wrote “we”. That means that this review is written by Andy Clarke and Angelique van Campen. The review is based on model version 0.8.79. 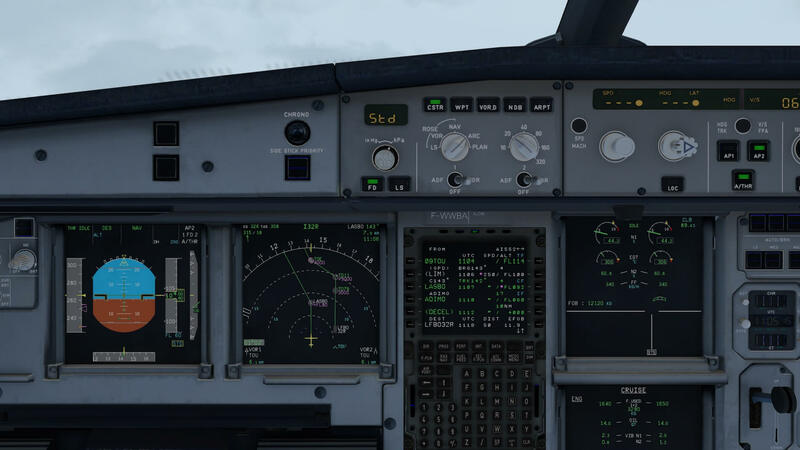 X-Plained.com is proud to present to you an exclusive and comprehensive review of the Flight Factor / StepToSky A320 Ultimate, brought to you by your personal reporters Andy Clarke and Angelique van Campen. We’ve decided to split our tasks. Each of us will do a part of the aircraft. Who’s doing what and why … that’s not important. Important is that you get an objective review that comes with facts and not with fiction! And no, you won’t find a sentence or section in this review that is dedicated to questions like “why should you buy this FF A320 and not one of the competitors” or “who’s better” or “who has the most realistic flight dynamics” and so on. Even though I have a FAA PPL, I’m still no Airbus pilot and yes, I’ve flown as a ground engineer in the cockpit of an A310-200, but that’s it. So even for me with my technical aviation background and real C152 flying experience, it is and stays difficult to judge if this Airbus model flies as real as it gets. 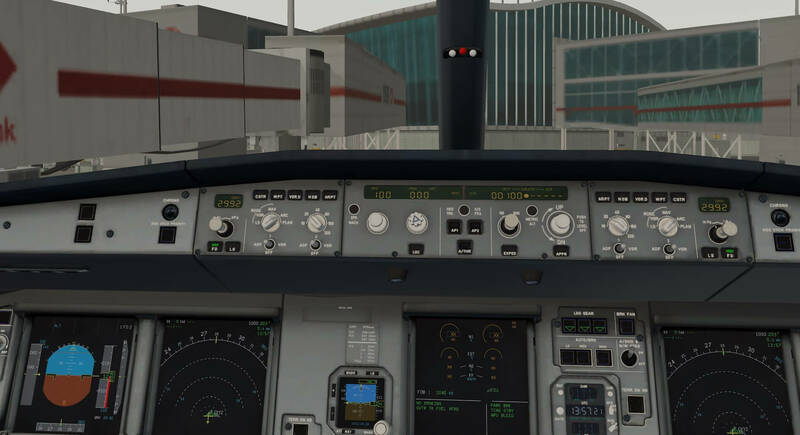 Only a real licensed ATPL Airbus A320 Family pilot could judge although without any motion, as is available on a Level-D FFS (Full Flight Simulator), it is not easy to get the same feeling as with motion or in the real aircraft. But we are lucky reviewers since we had the possibility to contact whenever needed, Marcelo Alencar and Frank Docter, active licensed Airbus pilots. Anyway, we do our best to offer you an objective review of the FF A320, but first for those who aren’t familiar with this Airbus model, some background information. The Airbus A320 family consists of short- to medium-range, narrow-body, commercial passenger twin-engine jet airliners manufactured by Airbus. The family includes the A318, A319, A320 and A321, as well as the ACJ business jet. 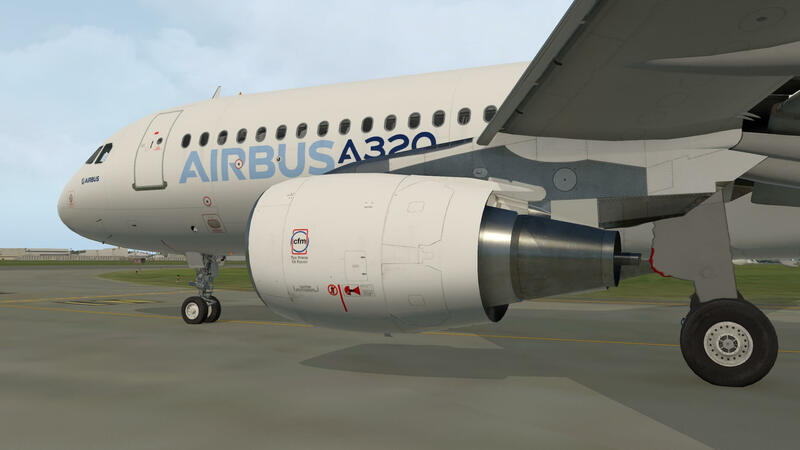 The A320s are also named A320ceo (current engine option) after the introduction of the A320neo (new engine option). Final assembly of the family takes place in Toulouse (France), and Hamburg (Germany). A plant in Tianjin (China), has also been producing aircraft for Chinese airlines since 2009, while a final assembly facility in Mobile, Alabama (United States), delivered its first A321 in April 2016 The aircraft family can accommodate up to 236 passengers and has a range of 3,100 to 12,000 km (1,700 to 6,500 nmi), depending on model. 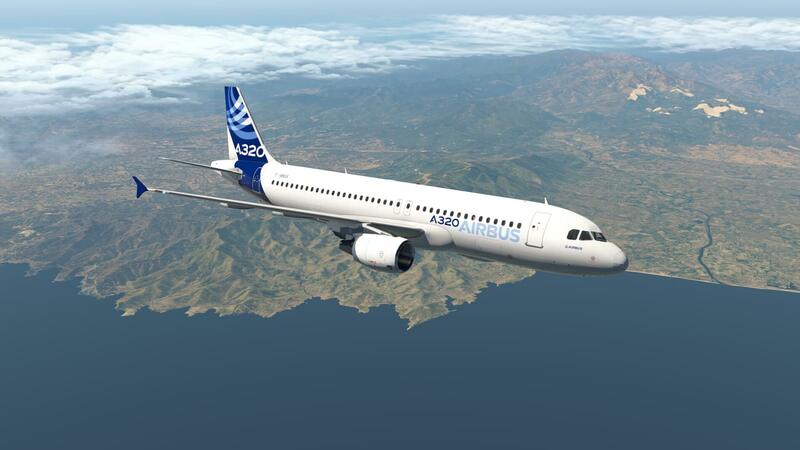 A320 Enhanced family (or A320E family) is the working title for a series of improvements to the A320 family. The improvements include engine improvements, aerodynamic refinements – such as adding large curved winglets (Sharklets), weight savings, and a new cabin design. In 2006, Airbus tested three styles of winglet intended to counteract the wing’s induced drag and wingtip vortices more effectively than the previous wingtip fence. 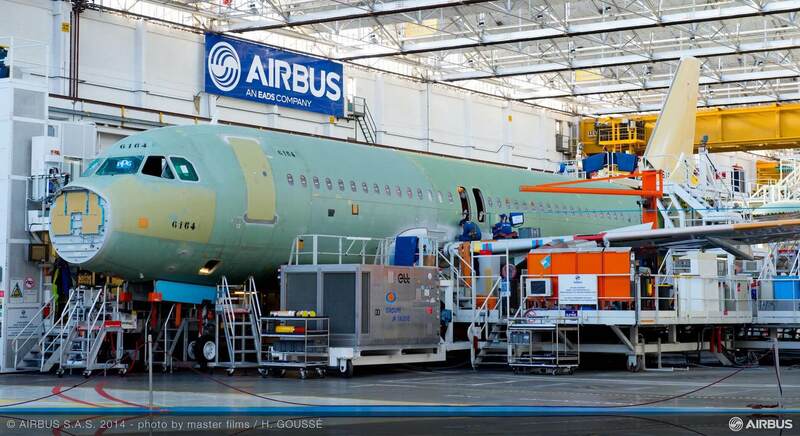 The first design type to be tested was developed by Airbus and was based on work done by the AWIATOR programme. The second type of winglet incorporated a more blended design and was designed by Winglet Technology, a company based in Wichita, Kansas. 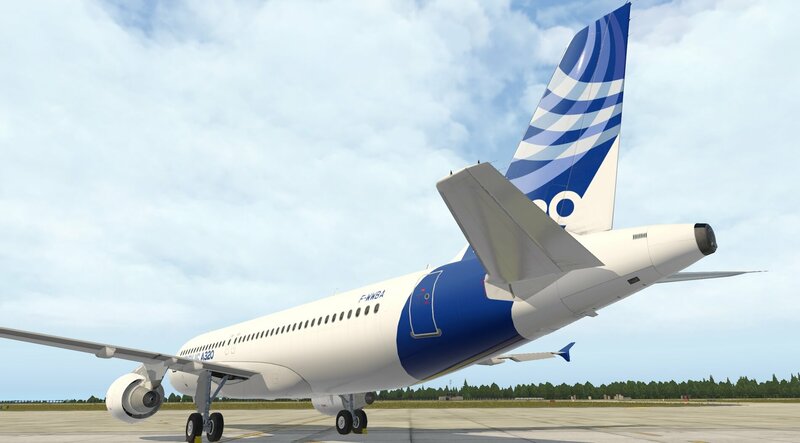 Two aircraft were used in the flight test evaluation campaign – the prototype A320, which had been retained by Airbus for testing, and a new build aircraft which was fitted with both types of winglets before it was delivered to JetBlue. 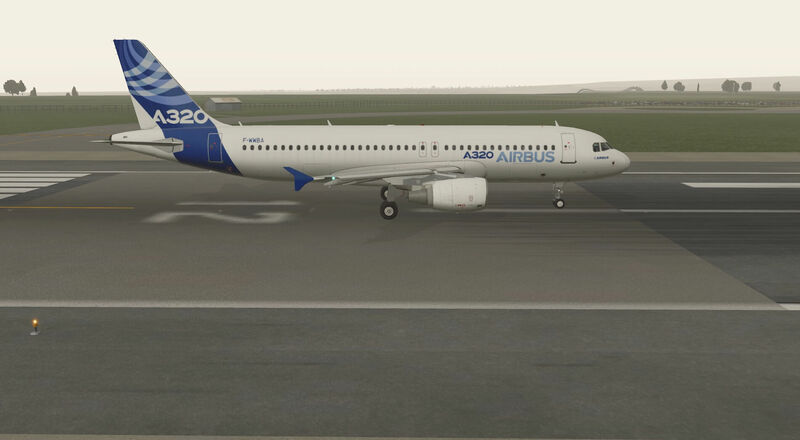 Airbus developed a new version of the A320, called A320neo, for new engine option, based on more efficient engines, at least partly in response to the threat posed by Bombardier Aerospace’s development of the CSeries airliner, with which Bombardier hoped to compete directly with Boeing and Airbus for the first time. 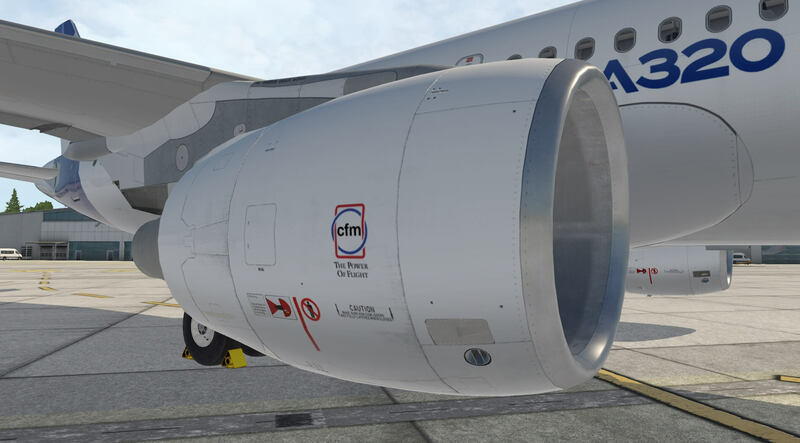 The choice for new engines include the CFM International LEAP-1A and the Pratt & Whitney PW1100G. Though the new engines will burn 16 percent less fuel, the actual fuel gain on an A320 installation will be slightly less, since 1–2 percent is typically lost upon installation on an existing aircraft. This means an additional range of 950 km (510 nmi), or 2 t (4,400 lb) of extra payload. 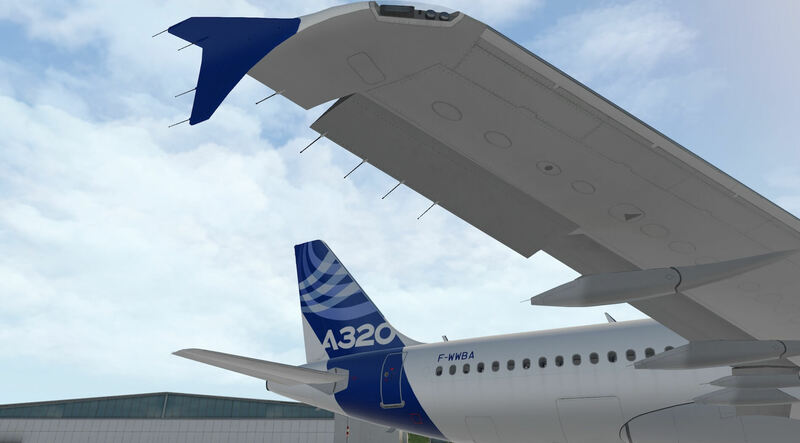 The A320neo will also include some modifications to the wing, mainly the installation of blended winglets called “Sharklets”. Download times will vary with internet connection but the process is straight forward to complete. 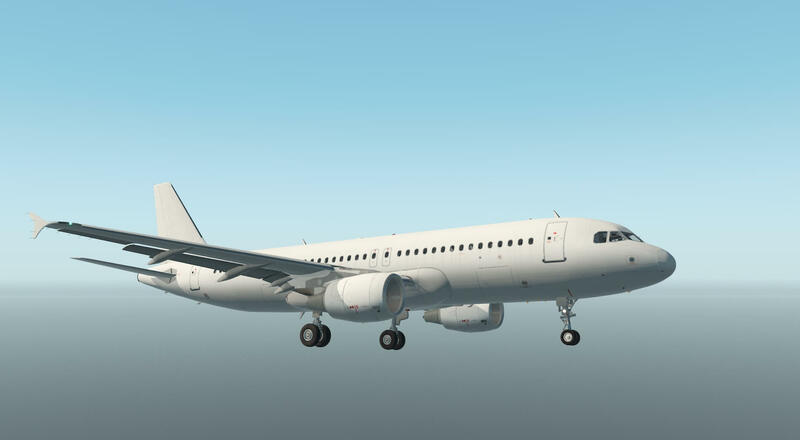 The download creates a folder named FF-A320 Ultimate which contains a resources sub folder and an aircraft sub folder. The aircraft folder contains the A320 folder itself and this, in turn, contains the documentation folder. The only documentation supplied is a manual of twenty pages and this includes installation instructions on page 11. 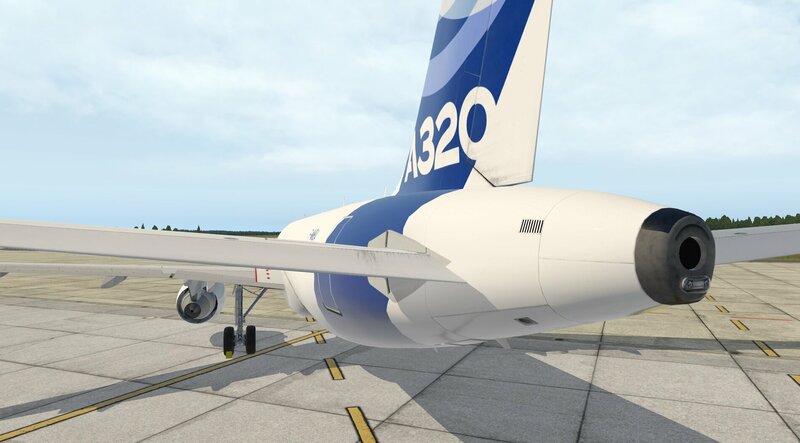 The A320 folder should be copied from the download to the X-plane aircraft folder, or a sub-folder if required. The resources folder in the download contains a CEF sub-folder and this should be copied to X-Plane/resources/plugins/. 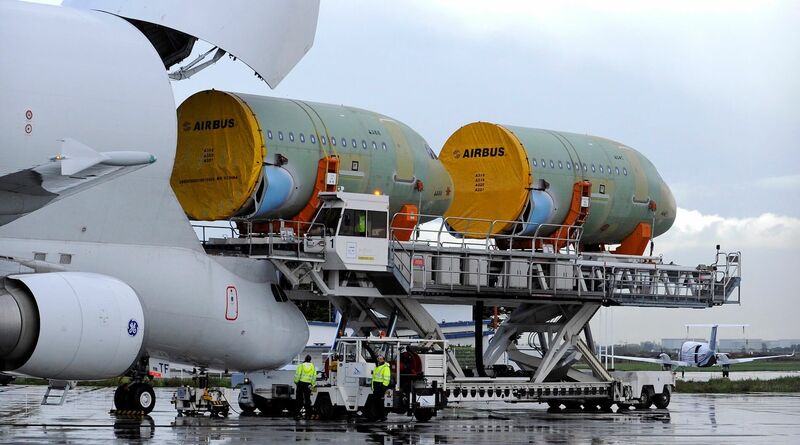 Once this process has been completed the aircraft can be loaded and will appear with engines off. 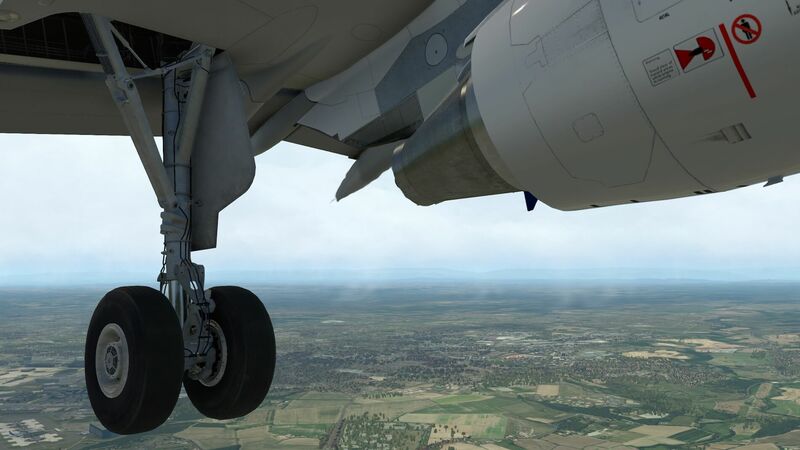 To be able to turn the engines on the product has to activated with a licence key provided with the download and this is done through the MCDU in the aircraft. Once done the aircraft is re-loaded and is fully operational. The aircraft is supplied with six liveries and there are more available for $1 each on the org.store. The aircraft also has an electronic flight bag including a map function using google maps. 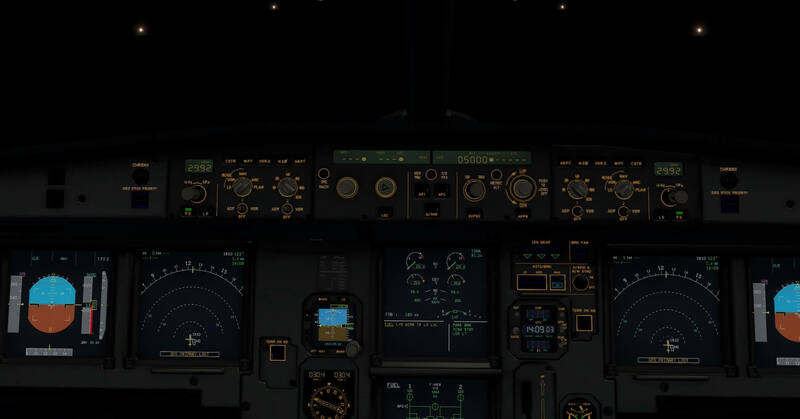 The function requires the input of an API key which can be obtained for free from Google and the manual explains how to do this and how to use the various functions of the EFB. Whilst installation instructions are half way through the manual the earlier pages cover the vision the development team have for the model and the systems provided. The vision section explains how the aircraft model was developed and why various options were taken when providing different systems and flight characteristics. The systems section explains what systems are provided and also those that are in development and intended for future updates. I would urge users to read these sections, and I understand why they are presented early in the manual, as it will manage expectations and hopefully prevent users trying to interact with the model in a way that is not yet possible. It should be noted that whilst this is called a manual it relates to the aforementioned issues and is not a manual on how to use the model. The manual does include references to links for tutorials and documentation. These relate to the real aircraft and whilst useful and interesting they are not bespoke to the model and therefore do not discuss specific issues. 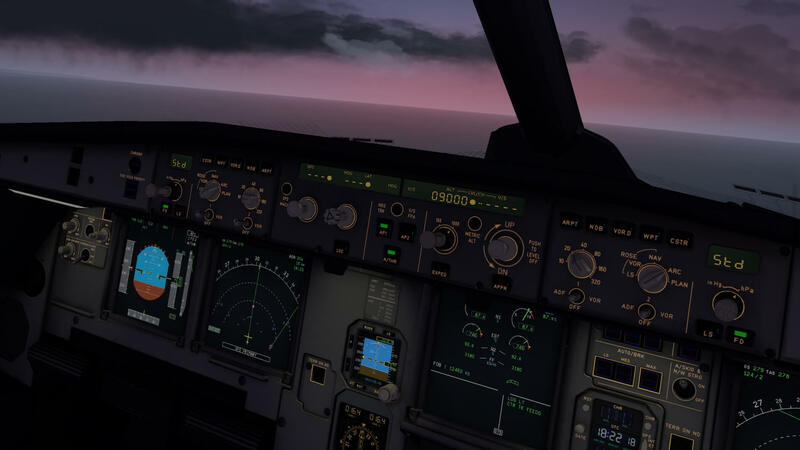 It is true that the realism of this model means that much of the information in the Airbus documents is relevant but this can be a daunting prospect to those outside of the real aviation community and can make the use of the aircraft a difficult prospect for the beginner. This in turn may lead someone new to this aircraft to load it with engines running at the end of a runway and then simply fly it. This is a good experience in itself but does not encourage a less experienced person to learn the modelled systems and therefore not enjoy the aircraft to its full potential. Whilst the tutorial videos show aircrew on the flight deck doing things correctly they do not explain why things are happening, what to expect and what to do if things do not work. I experienced this on several occasions and the frustration of then having to research the issue through several documents, whilst not being sure if this was a limitation of the model or user error, did distract from the enjoyment of the user experience. 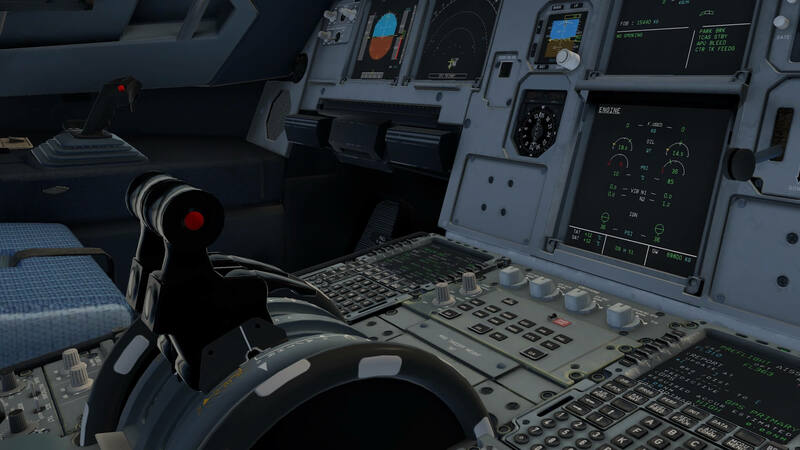 I know developers have worked the model from scratch, and experienced pilots and simulation users may work their way through this more easily, but spending time with the documentation and providing a comprehensive, bespoke manual, even with references to Airbus documentation, would allow all users to experience the model in a way that the hard work of the development teams was intended to provide. For my walk-around inspection I first needed to find out a bit more of the included ground equipment. 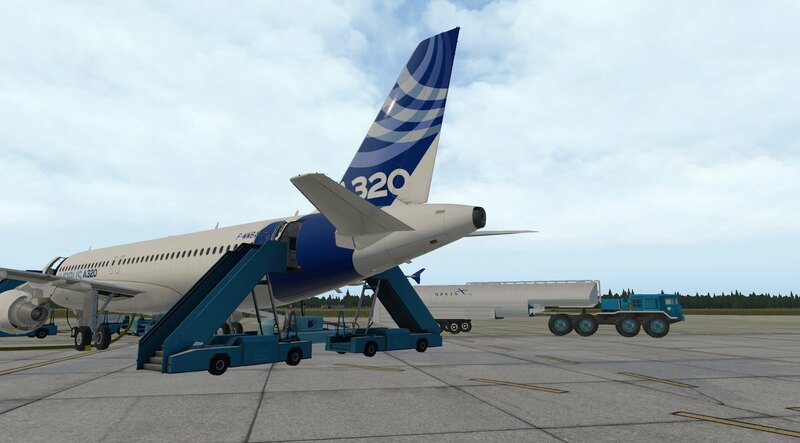 The FF A320 Ultimate does have, not always a part with other developers, a lot of different ground equipment included a fuel truck, GPU (Ground Power Unit), stairs, and so on. That it is included with the aircraft package is good news, but it feels and looks so old-fashioned. Honestly, I’ve seen during the years being a ground engineer flying to different places many types of ground equipment, but I’ve never seen such a GPU or that kind of fuel truck as part of the FF A320. Have a look to the following screenshots. Some will say “ah, it looks OK, other simmers will say that it’s indeed a bit old-fashioned or modeled as they’ve never seen before”. Whatever your thoughts are, it’s worth to bring forward the JARDesign Ground Handling Deluxe package. 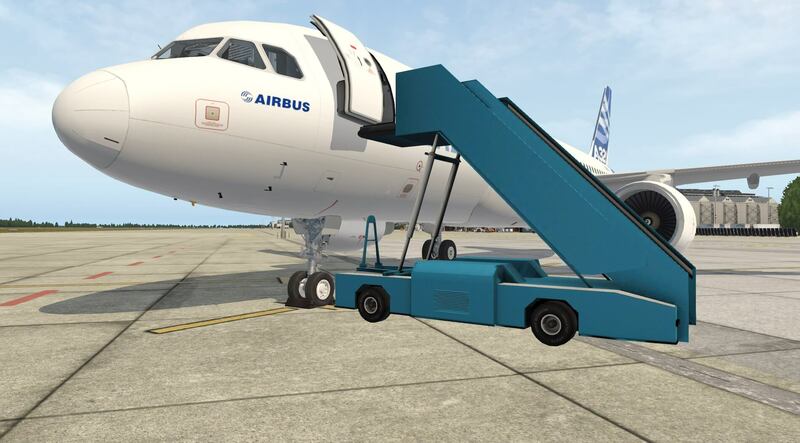 Oh no, I won’t promote it since the review deals with the FF A320 Ultimate, but I would highlight that other ground handling equipment with much more options and variations is available for the FF A320 Ultimate. As usual, I start at the NLG (Nose Landing Gear), via the engines along the wing leading edge to the wingtip, then back via the trailing edge, stopping at the MLG (Main Landing Gear). From here, I walk to the aircraft tail and then, similarly, but using the other side of the aircraft, back to the NLG. The NLG has been modeled in great detail. No doubt about that. When I say with great detail I really mean that. Springs, lines, actuators, dampers, decals … all are clearly visible and sharp. The overall NLG strut is slightly weathered and the wheels look good and realistic too. You’ll see what I mean in the following screen shots. It doesn’t stop with this NLG. The fuselage decals are a bit blurry during a close-up inspection. With the SLATS and FLAPS extended, I’ll pass from the NLG to the engine. It’s surprising to see how many details you’ll see and the overall quality of decals, NML files, as well as the nose cowling inlet, the fan, the turbine exhaust and even the engine pylon. They did put a lot of time in the engine to model it. Along the wing leading edge, with the extended SLATS, I can see the SLAT tracks. Not that SLATS are such impressive components, but with the NML files they look really good. The wingtips are nice. The wingtip does offer all the lights I expected and important to know that during your walk-around inspection you can do a complete light test. You can also test the STROBE lights with the switch on the ground in the ON position. And, just as on the real aircraft, at the wingtip, you’ll find several static dischargers. Luckily for you, there’ll be no need to do maintenance! They are all installed and there’s nothing broken. The main landing gear (MLG). 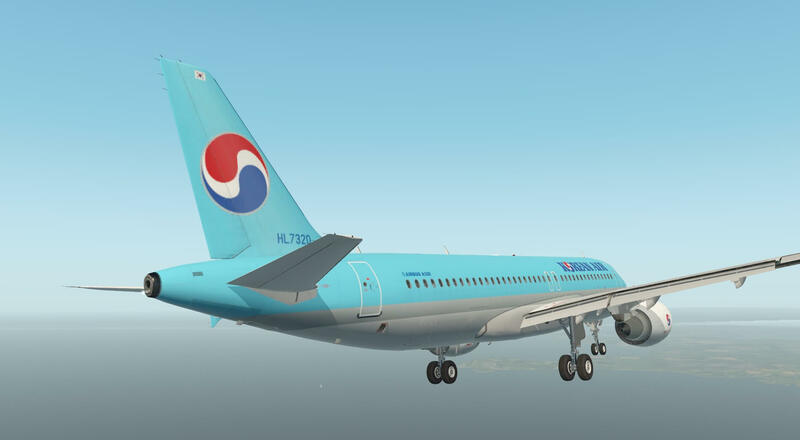 Due to the high-resolution textures (4K), many details are visible on the wing top and bottom surface. Together with some weathered aspects and dirt, it gives the overall wing skin a good look. The same for the MLG with it’s fixed and large door. The tiny details on the NLG are also present for the MLG. Besides the same tiny details you’ll find the brakes, hydraulic lines, tire pressure sensor and even the brake wear pin. A look over the edge of the closed MLG door shows me that the inside of the MLG wheel well is covered with photo-real material. This gives the main wheel well a realistic look, although it’s only a photo with no real lines, valves, accumulators etc. I could stay here for hours, but I’ve more to do. The fact I could stay here for hours simply means that I’m impressed with the overall MLG modeling. Walking down the fuselage, I reach the tail section with the horizontal and vertical stabilizers. The fuselage tail section with the APU (Auxiliary Power Unit), rear tail navigation light and strobe unit are well modeled as are the stabilizers. Even the visual THS (Trimmable Horizontal Stabilizer) indicator on the front of this unit is visible and relatively sharp. At the rear of the elevators and rudder, you’ll find some static dischargers. Just as we saw on the fuselage and wing area, we find NML files that give the aircraft the 3D effect. Under the correct lighting conditions you’ll get a realistic surface skin. The only thing that’s left, is getting back to the NLG by way of the other half of the aircraft. 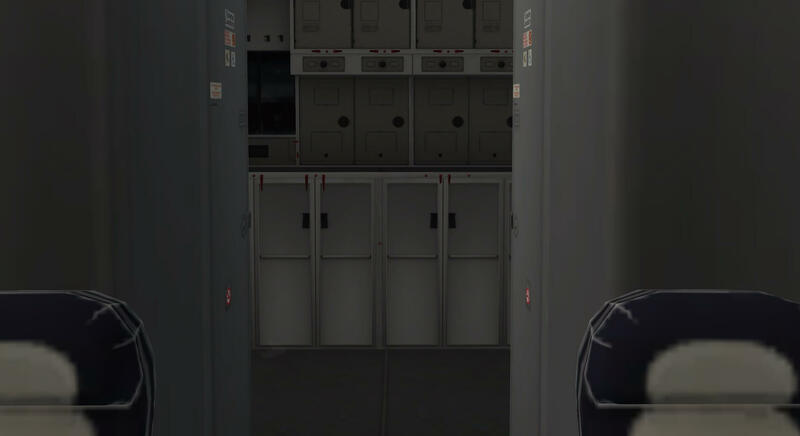 However, now I have the chance to check and see the cargo doors and cargo holds. The BULK cargo door can’t be controlled to open or close, but the AFT and FWD cargo doors can. 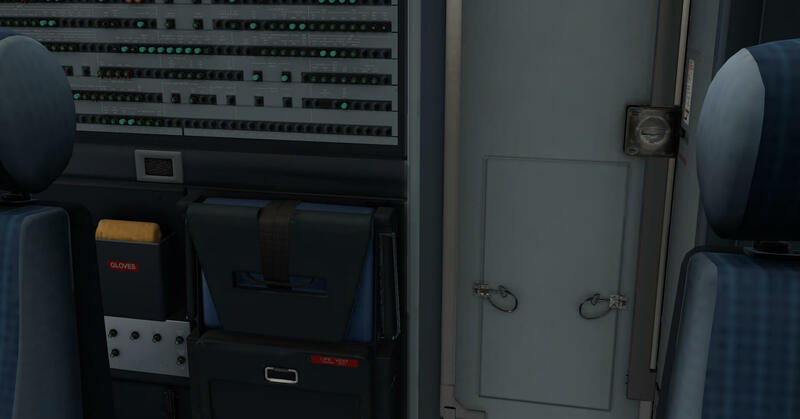 When opened, you can clearly see the latches and pins, actuators and door hinges. When open, you have a good look of the cargo hold interior. It’s grey as it is in the real aircraft too. Most of the time, the inside of these cargo holds are covered with off white GFRP (Glass Fiber Reinforced Plastic) panels. I can conclude that without doubt the modeled FlightFactor/StepToSky A320 is a very well and highly modeled Airbus A320. But it is also fair to highlight a couple of things that need in my humble opinion some improvements. The slightly blurry look of some of the decals on the fuselage and wing as well as the tail could be in my humble opinion better. Hopefully we get in the future also liveries with gears that are not as clean as these are now and this also applies for the tire assembly. I have seen in my life many clean gears, but that was only when a new gear was installed. After a couple of flights they are dirty, and the modeled gear textures show a bit on dirt, but not enough. And yes, I know, it’s how your personal reporter Angelique sees it! The aircraft interior is modelled with a great attention to detail and matches the effort put in to the exterior of the model. When sitting in the flight deck views out of all the windows are crisp and clear with a slight glass/reflection effect. The switches and controls are clear and sharp and remain so whatever the level of zoom. 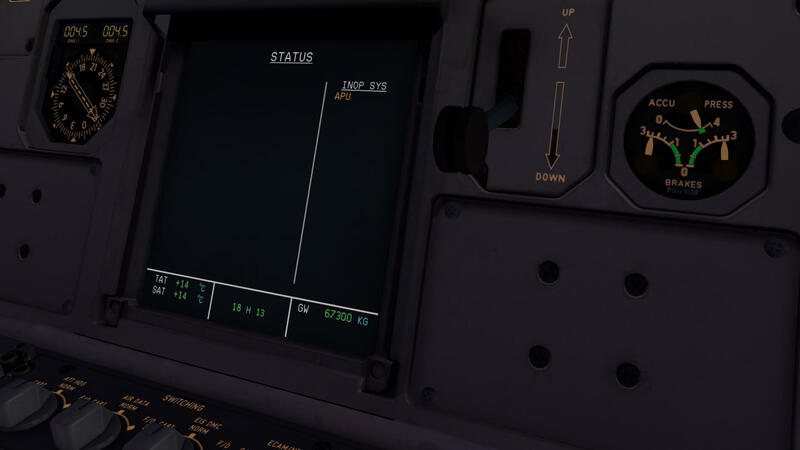 Labelling across all instrument panels is easily legible and when using the switches and levers a plus or minus sign appears, when the mouse is hovered, making it clear which way they will move given that command. Screens and displays are bright, responsive and the large and varied amount of colours used adds to the realism. Most screens and displays can be “popped out” to make them easier to use. Sun visors can be moved to an operational position. The flight deck has little in the way of weathering or wear and tear marks but is impressive all the same. Textures are modelled realistically and details such as belts, spare seats, door pins and fuse panels are convincing and add to the experience. Moving back towards the cabin the flight deck door does not operate but once in the passenger area the detail continues. Seating is modelled for two different standards and the leg room and comfort appears different. Views from the windows are clear and details such as crew seating, galley and storage areas and overhead lockers are very well modelled. 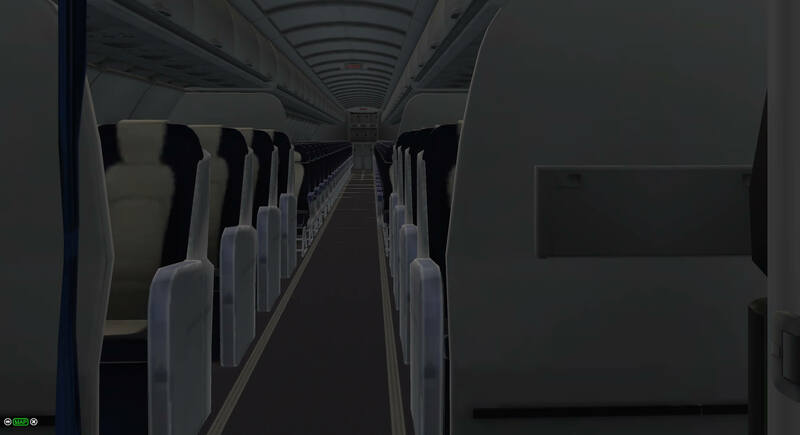 The views up and down the passenger aisle provide depth in the aircraft and create the airliner atmosphere. Again weathering and wear and tear is limited but this does not make the cabin any the less convincing. During darkness the lighting in the flight deck means the instruments and displays remain clear legible and easy to use. 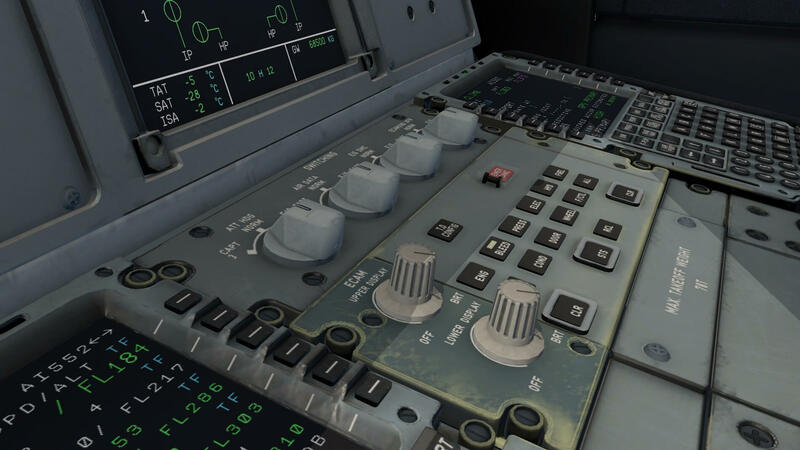 The attention to detail and the use of multiple colours and textures create a convincing and realistic environment inside the aircraft with instrumentation, displays and switches clear and legible at all times. An impressive model. With the release of the Flight Factor/StepToSky A320 Ultimate, I’ve also seen a new flight plan extension. The A320 Ultimate comes with a flight plan file named corte.in. At first, I thought … oh my goodness, what kind of extension is that and how to deal with it. While searching the Web, I found some useful information at AVSIM and later I found out that Little Navmap, a awesome freeware program, was able to handle and deal with this new flight plan format. That Little Navmap can do a bit more then just creating flight plans and save them in many formats isn’t important for now. 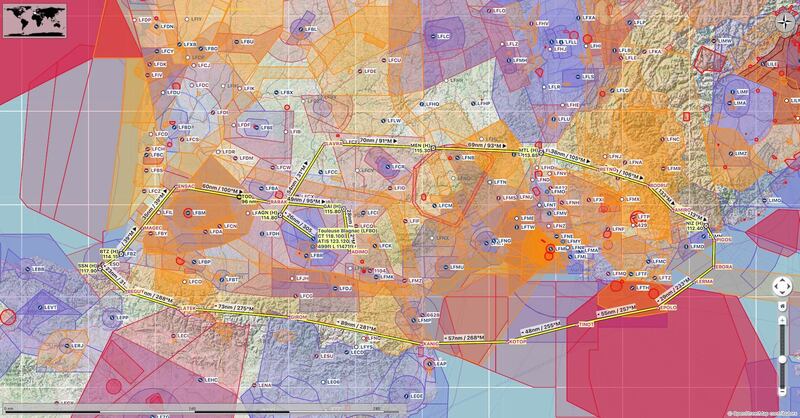 Important is that a created flight plan with Little Navmap can save your flight plan in corte.in format. When you look with a text editor in the corte.in file, it looks like that we’re dealing with a kind of RouteFinder txt format, but sorry to say, it’s a bit different and not “1 to 1” transferrable although it is possible. Find below the listing of which components are mandatory (bold) in this file and what’s optional. I’m aware that these proposed flight plans are very limited, but what I want to make clear is that you always start with RTE, followed by the name of the flight plan, here that’s LFBO01 (02 and 03) but that could be also LFBOEHAM thus the departure and arrival airport. In the LFBO02 I added one waypoint (VOR AGN) while in LFBO03 I added two waypoint (VORs TOU and AGN) connected to each other via the DCT (DIRECT) command, but that could be (not for this) also an airway. When you understand this, then you can expand your flight plan, keeping in mind the rules to follow. I think I mentioned this before, but it’s important enough to highlight it once more. You can edit your own flight plan directly with a text editor, but in my humble opinion it’s much easier to use Little Navmap to generate the flight plan you want and then export it as corte.in. Just leave the name as it is thus corte.in. It will add the created flight plan to the corte.in file. Something needs to be highlighted although it’s an optional field; Cost Index. Little Navmap can export if you with everything of the mandatory field and the optional fields except for the CI. After consulting Little Navmap I was informed that it doesn’t support CI. Then you have the possibility to enter the CI via the MCDU what seems to me more logical. It’s in my humble opinion not normal to have a flight plan that offers already the CI value and other values like a SID, STAR and so on. To me, a flight plan should be a collection of the departure airport, waypoints and the arrival airport. Runways, SID, STARs TRANS(itions), cruizing ALT as well as this CI, should be added once a “clean” flight plan is loaded in the MCDU. This makes a flight plan universal for every flight, at least, that’s the way I see it! Now that we know this, where can you find the corte.in file? Look into the aircraft sub-folder data. Another option for creating a flight plan is of course using the MCDU and enter waypoints and/or airways section by section and save the entered flight plan. 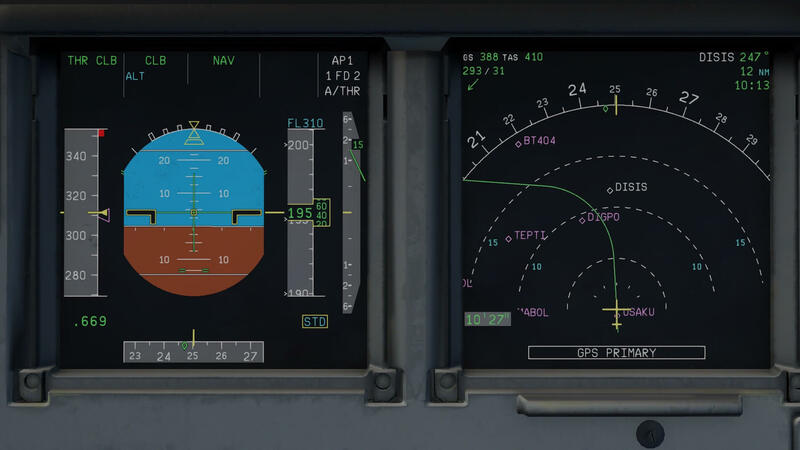 As of this writing – March 16th 2018 – both Aerosoft NavData Pro and Navigraph both offer the different then normal “look and feel” navigation database. The cycle package for the A320 Ultimate isn’t much more then a cycle_info text file and a nav.db file which is roughly between 65 to 70MB. These files can be found, in case you have to install the Navigraph package manually, under the aircraft data sub-folder. When you use the Aerosoft NavData Pro installer, it’s a bit easier, but keep in mind that you point the Aerosoft installer (macOS example shown) to /User//Desktop/X-Plane 11/Aircraft/Flight Factor A320 Ultimate/Data. 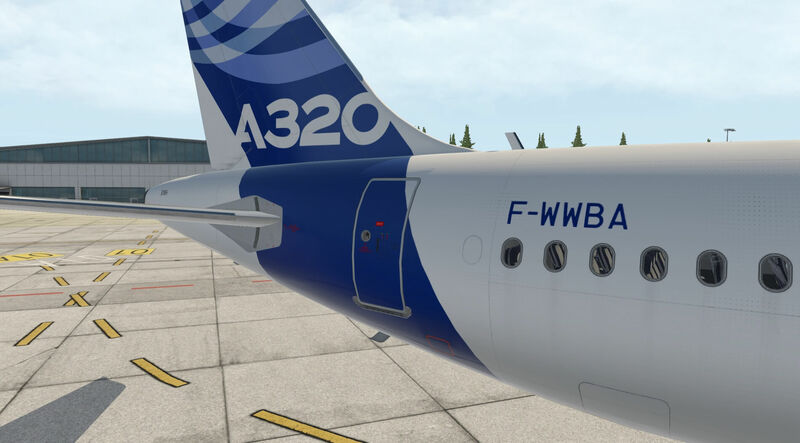 Keep in mind that you could have a different X-Plane 11 folder name as well as the FF A320 Ultimate folder name! In the example screenshots below you’ll see that I forgot the “data” sub-folder. Not a problem, but then the Aerosoft package will be installed one higher situated sub-folder. Looks good right … no, it isn’t! The FF A320 aircraft data folder offers by default a nav1.db and a nav2.db file. What you should do first, please make a copy of this data folder and store it as a save place. OK, first delete nav2.db. Next, rename nav1.db to nav2.db. And finally, rename the new nav.db to nav1.db. Then the MCDU will show you the latest active AIRAC period and the previous AIRAC cycle. Don’t worry to much. 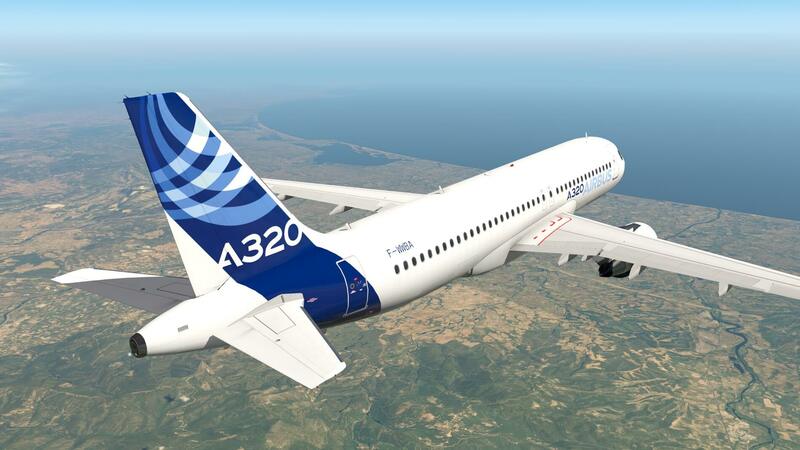 It deals with the planned flight plan to test the FF A320 Ultimate. 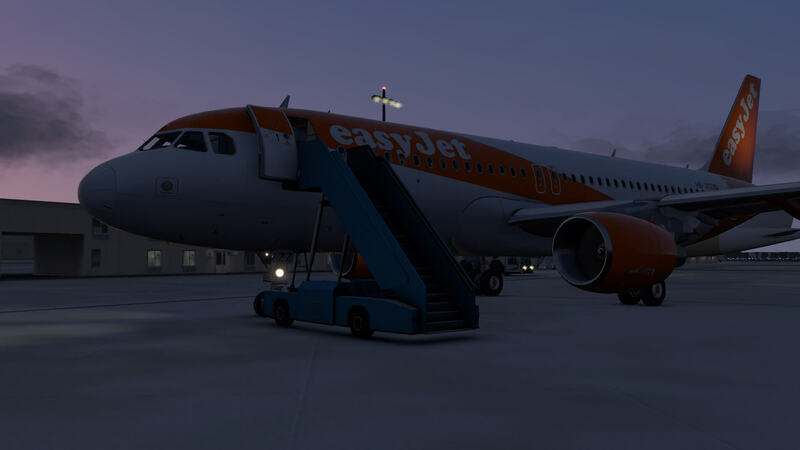 I’ve decided to make a test flight from/to LFBO Toulouse/Blagnac. I like the warm climate over there and I made the flight plan a bit longer to make it possible for me to test a bit more then I normally would/could do. 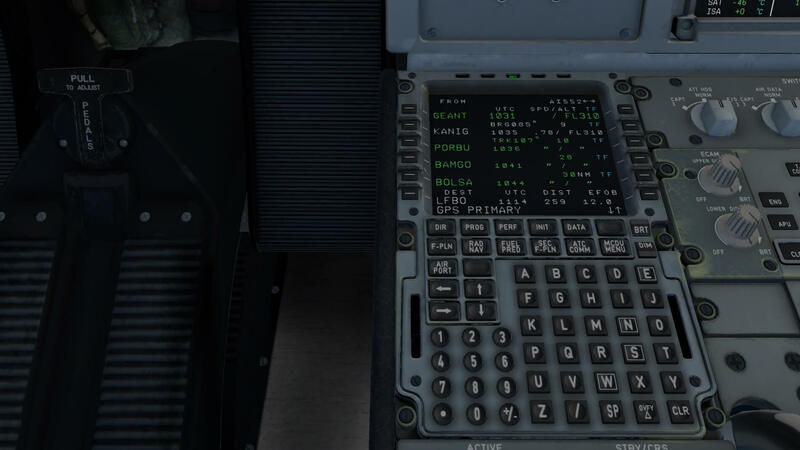 One of the necessary steps for a successful understanding of the FF A320 and flying with it, is using a checklist. 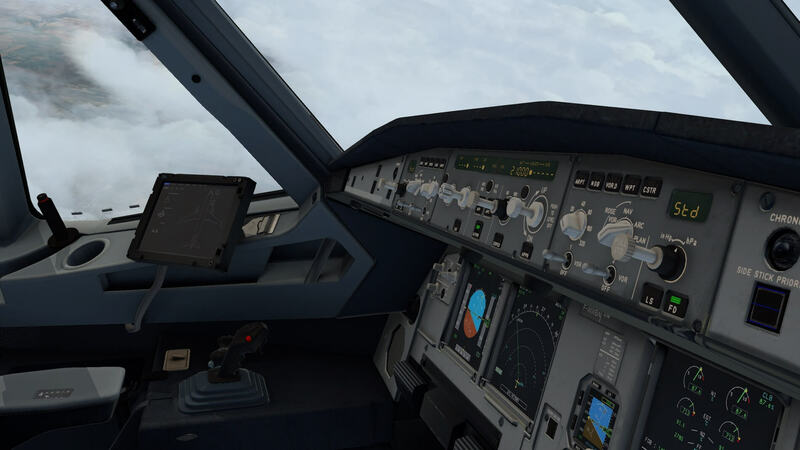 Using and flying the FF A320 without a checklist or starting up the aircraft with engines running is, in my humble opinion, not realistic and not worth this highly realistic modeled aircraft. That said, the EFB (Electronic Flight Bag) offers a static checklist tab. On purpose I write “static” since it’s not interactive. This means your actions aren’t verified by the EFB. 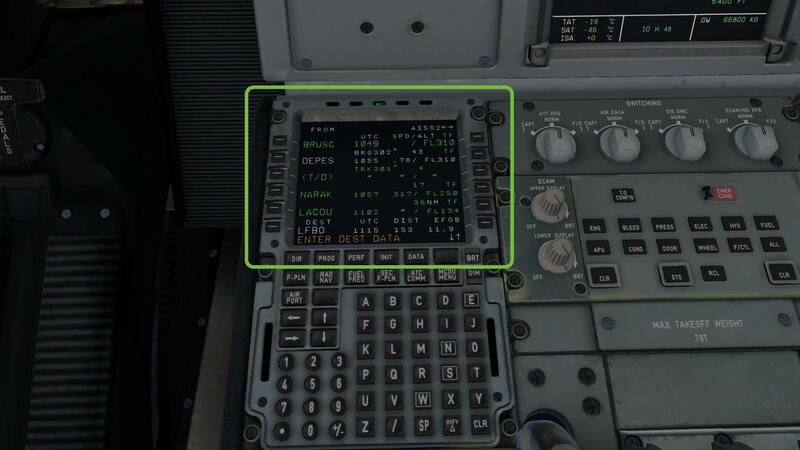 Since the EFB isn’t easy to access, you can also use its popup function. 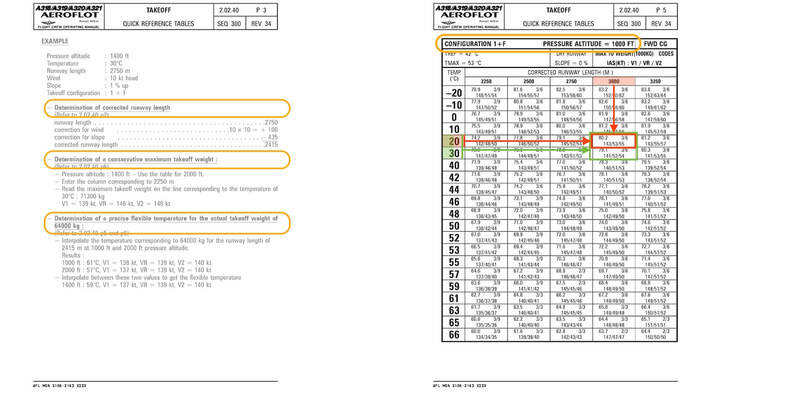 Only disadvantage I found is that the default EFB popup size/dimensions, are for reading the checklist, way to small. Not a problem, resizing is possible by moving your mouse to one of the corners, hold the left-hand mouse button, drag it and resize, but then the EFB could take up a lot of space on your screen. Another option is using the XChecklist plugin together with the clist.txt file which can be found at X-Plane.Org. 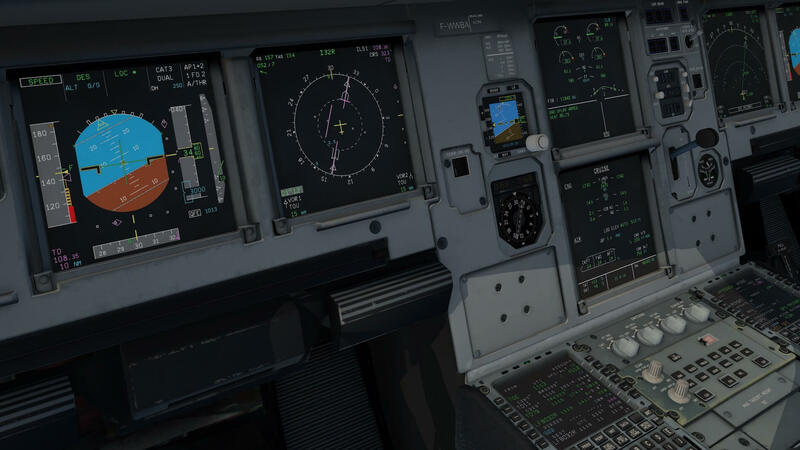 I did a quick test by using this partly interactive checklist – well done by the way – but the clist file and thus the checklist items are not completely as you’ll find in the real checklist or normal procedures and not the same as integrated in the FF A320. That said, I either use the build-in EFB checklist or I print out the “Preliminary Cockpit Preparation” section of the “Standard Operating Procedures” or read it via my tablet. The advantage of the Preliminary Cockpit Preparation list is that it not only says what to do, but also what to expect to see and why something happens. As already indicated by Andy, as of this writing April 2018, the aircraft package doesn’t come with the decent manual besides the 20 pages of which 14 pages are useful. This is absolutely not enough for such a complex aircraft. 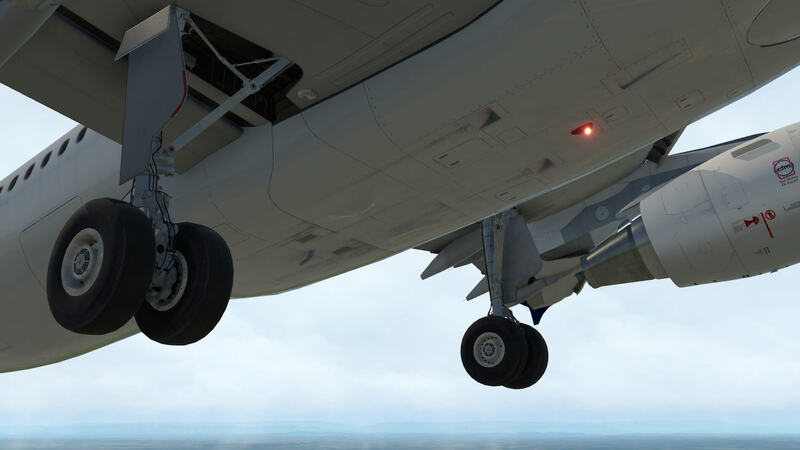 After consulting Flight Factor Support, I got the following links, but especially the link to the FMS Thales FGMS is nice, but not for regular simmers. For the simulated FF A320 FMS, you should have a look into this manual. Feel free to download it although I personally would have seen that sections of this official Smiths Thales A320 Family manual where included in an own FF manual. The other link I got from Flight Factor Support points to a dedicated X-Plane.Org page “Aircraft docs and info”. 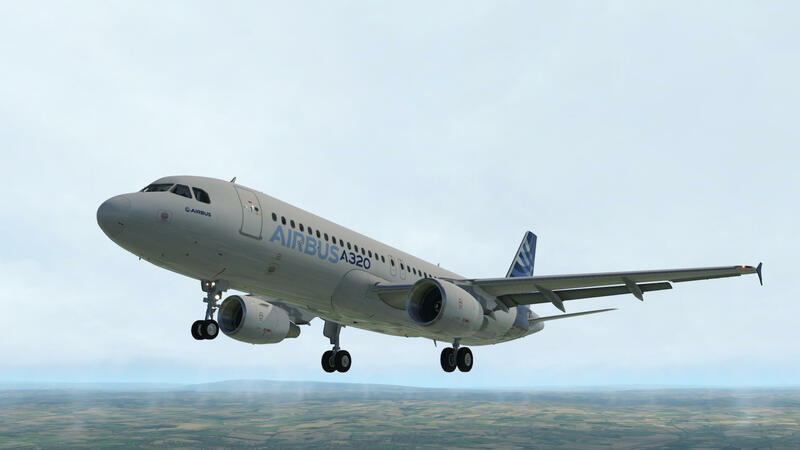 I think for those simmers who own already another Airbus A320 X-Plane model, that these links are known by them, but for those who haven’t got a good FCOM or other related manuals, look and see if you can live with these links. The fact that the FF A320 Ultimate package doesn’t come with a comprehensive tutorial is not good in my humble opinion. I prefer to reframe myself from this, but look to the ToLiss A319 which has an awesome tutorial. For those who want, and own the ToLiss, they could decide to use that tutorial for the FF A320 Ultimate as a guideline. Just a suggestion! What said before, from a cold and dark situation I work my way through the standard operating procedures pages. A couple of switches on the overhead panel aren’t simulated yet. I say on purpose “yet” since the aircraft is still improved as can be seen on the model number version 0.8.79. Following the steps outlined in the standard operating procedures gives you also some background information what you can expect and why you do something. 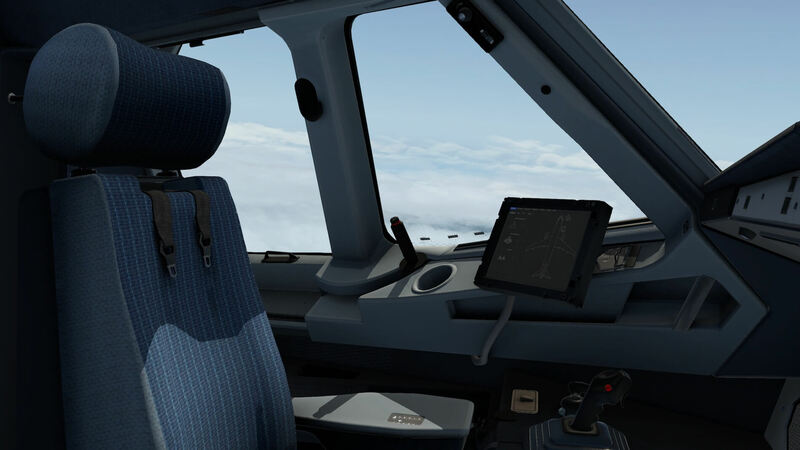 It’s overall a good way to learn how to deal with the FF A320. I mentioned it before … please don’t use the option “aircraft with running engines”. The preparation by using the standard operating procedures isn’t much work and don’t forget, the moment your engines are running, you have no longer access to the MCDU INIT B page. This INIT B page is important for you ZFW/ZFWCG and the block fuel. Whilst Angelique used her experience to review the whole flight system I looked at how feasible it is to simply get in and fly the aircraft and use it both with an engines on start and from dark and cold as a relative beginner. Starting with engines on at the end of a selected runway is straight forward but even moving the thrust levers to take off I invoked several warning sounds and alarms. I was able to react to most of these and take off successfully. Even though I did not follow all procedures I enjoyed the flight as the aircraft was stable and enabled me to enjoy the scenery and the experience of flying such an aircraft. I completed a circuit, though I had to adapt to the distance and altitude covered in a short time compared to GA aircraft. I found landing to be a real challenge in this “free flight” mode and could never claim a good landing when not using the aircraft support systems. Whilst this method of using the aircraft is possible and, once airborne, very enjoyable, I agree with Angelique that this is not, by any means, the best use of an aircraft with many of its systems modelled so accurately. The challenge I found was taking the experience further as a beginner, without a bespoke manual for the aircraft. Understanding the requirements of starting procedures was an issue and with all the Airbus manuals available there was almost information overload for someone trying to create a flight more advanced than my first one though not as in depth as someone with Angelique’s understanding. The challenge became getting it to work rather than learning to fly it. I tried to follow the EFB check list and found that some systems did not work as I expected. This does not mean they are wrong but perhaps modelled more accurately and need more processes such as aligning IRS. I had never had to do this before and as there was no manual it took me some time to sort it out. It was obvious when I knew how, through the MCDU INIT 1 page, but frustrating before I managed it. In this intermediate flight I would not be as painstaking or accurate as Angelique would be, but with no IRS I had no active GPS either so autopilot and the navigation display would not operate. Having established how to set up the system I was able to input a flight plan. Angelique has discussed the use of the MCDU in greater detail in her flight but I found that it would not accept flight plans created by Goodway. 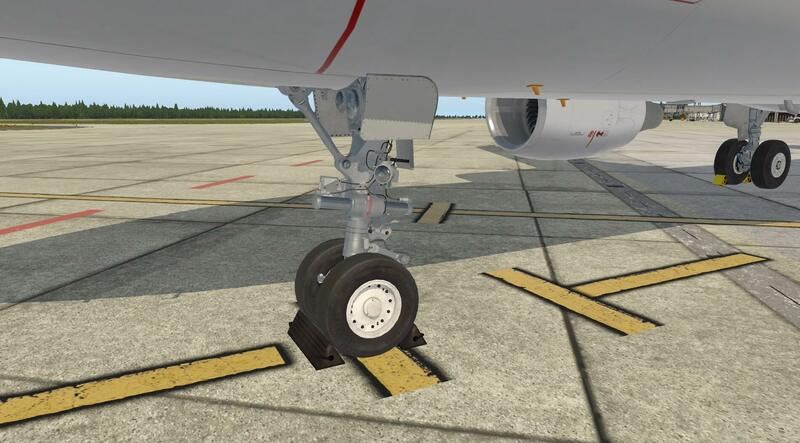 The ground handling functions worked well and I was able to set fuel, passenger and cargo levels easily. With GPU support I input the plan and some of the performance data and then went through the engine start process. 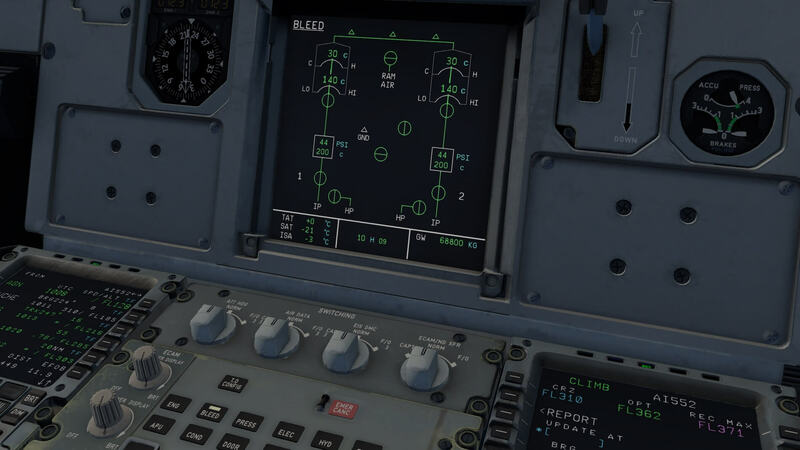 This worked well and I was able to use the appropriate systems in order, using a different checklist from the EFB, through the A330 SOP documents. The aircraft taxied easily and responded well to controls. Take off went well, again following the alternative checklist, and I was able to activate autopilot. I did have an issue removing TOGA LK but having found the solution the model flew very well under autopilot control, being smooth and responsive and following inputs as expected. The flight experience was very good although I perhaps did not follow every process correctly, nor use all systems to their full potential. This is a further issue of having no manual as I did not know what to expect the model to do and as a less experienced pilot would not know what to look for. The autopilot greatly assisted matching speed with altitude change and I found ILS landing was achievable without too many problems. I repeated the flight and having learnt the processes I chose to use from the previous flight I felt I made a much better attempt at it. This a great aircraft to fly, especially using the systems provided that are modelled very accurately, but as a less experienced pilot I am left wondering whether I have used the model to its full potential, not having a manual to refer to, and if not how to push the experience further. The aircraft has an electronic flight bag alongside the pilot and co-pilot. This allows for ground services, fuel loading, passengers and cargo to be controlled. It has performance data sheets for setting up the performance data in the MCDU, which Angelique explains in detail later, static, non-interactive, checklists, and a browser. 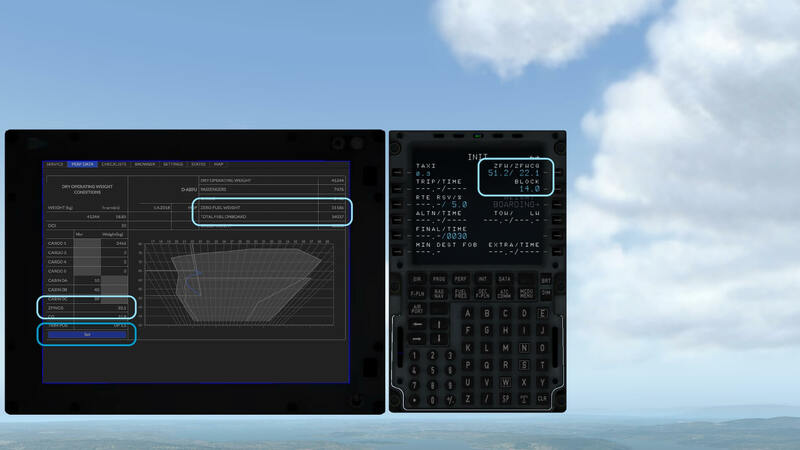 The EFB also has a settings menu which allows control of the panel quality of the model, toggling of reflection effects, control of the rain effect and the IRS alignment speed. This page also controls server settings for remote control of the browser function. 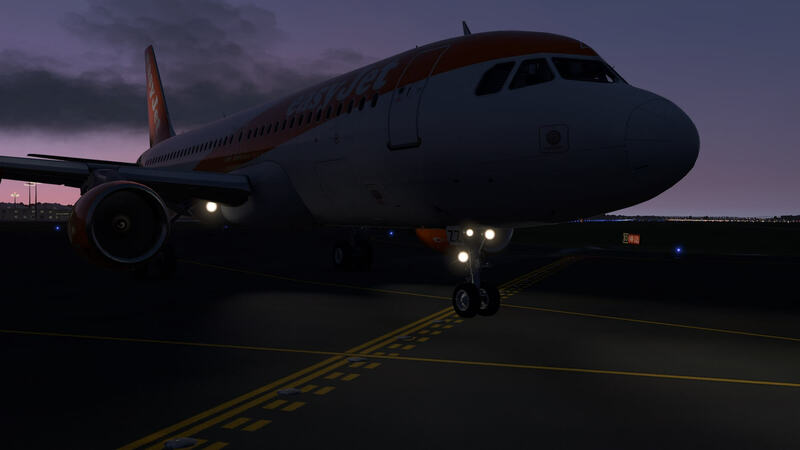 A States tab allows flights to be saved as well as setting the aircraft situation including special states such as cold and dark, turn around or engines running. The final tab in the EFB is the map tab. As mentioned before it does require a free Google API number to function but once entered Google maps can be displayed with a red marker arrow showing the aircraft position. 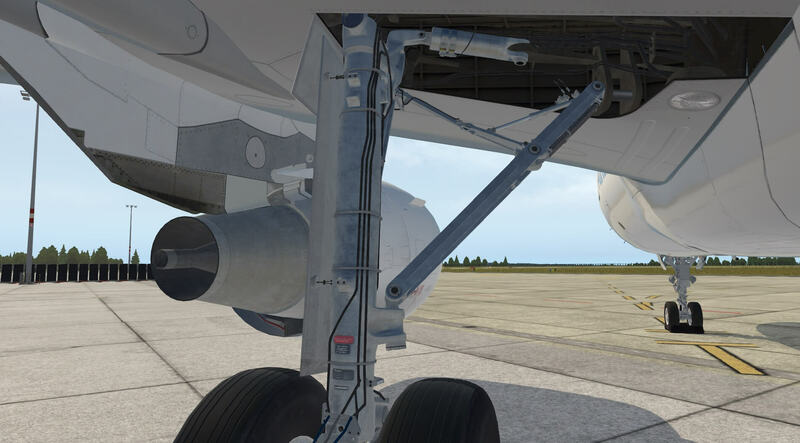 The details for the model on the X-Plane.org page highlight how the systems are modelled accurately to the real aircraft with the electric, hydraulic, fuel and pneumatic systems highlighted. Having not flown an actual A320 I cannot comment as to how close these systems are to the aircraft but certainly in starting up from cold and dark they react and create an immersive experience. The navigation and control systems are available and the displays for these provide the pilot with a huge amount of information. The systems react and change with inputs and updates in the MCDU and also to pilot input to the controls. The large amount of different systems and information can be daunting at first but practice and research makes their use become more and more straight forward and the information provided then enables better and more realistic flights. The manual supplied with the model has a section on the systems and does allow the user to know what to expect and the planned development and updates for the model. The manual explains that the four base systems of electrical, hydraulics, fuel and pneumatics are built around the laws of physics and adhere to those laws. The systems, and the computers that control them are modelled in detail to allow many functions to be used and observed. Whilst the standards of the systems are good the developers accept there may be occasional anomalies and are constantly working to improve the whole model. The manual goes in to detail as to how various functions are modelled and where the developers see opportunities to make them even better. 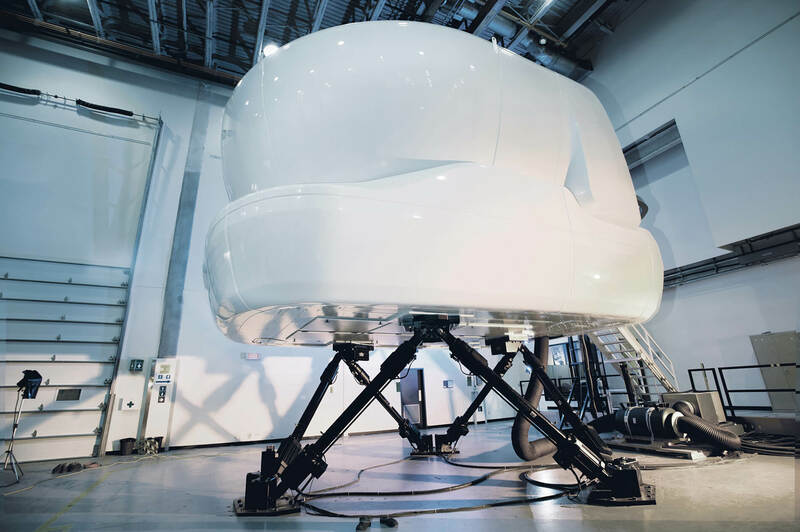 The aircraft is intended for normal use at present and there is no provision for creating failures and emergencies in settings and when loading the aircraft but fault simulation is planned for the future. The developers are clearly determined to create an aircraft with highly realistic systems and these manifest themselves not only in the aircraft displays and ground support but also in the way the aircraft behaves and reacts to changes in those systems. Before starting this section, let me first tell you which aircraft model is chosen as well as which engines are fitted. 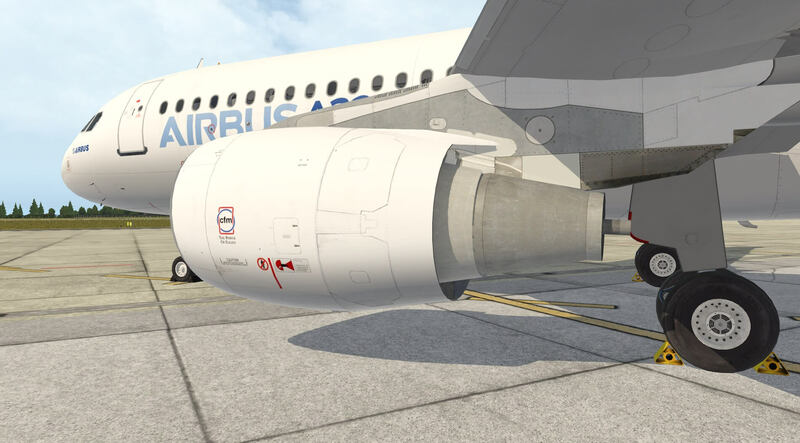 The Flight Factor A320 Ultimate simulates an Airbus A320-214 with CFM56-5B4. While doing the necessary EFB and MCDU preparations, I ran into a problem, but let me first give you some background information. In the old days, and depending on the airliners policy, pilots had to fill in their load sheet as well as calculating their own TO performance like the VSpeeds, FLEX TO temp and so on. Example charts can be found in FCOM volume 2.02.40 as well as the QRT (Quick Reference Tables), but more about those later. In the old days, an aircraft could be equipped with a FMS and CDU (Control Display Unit). No no, CDU is correct. During that time – I’m almost talking 15 to 20 years back – it wasn’t yet a MCDU (Multipurpose Control Display Unit). It was just a CDU and it was used to receive input data that was used by the FMCs, whereas we call the whole system the FMS. 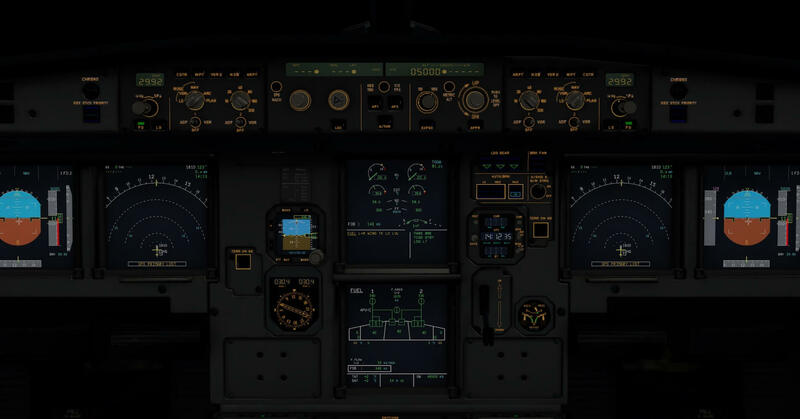 Anyway, looking to modern aircraft like the simulated FF A320 – but the following is also applicable for other Airbus aircraft like the A330, A340, A350, A380 – real pilots enter these days data into the EFB for their load sheet information and for their TO data. Calculated data from the EFB is then manually transferred to the MCDU. Airbus also offers OCTOPUS (Operational and Certified TakeOff and landing Performance Universal Software) software, but this is for the dispatch department only. While not going too deep into Octopus, Octopus allows dispatchers to enter all the necessary data needed for the TO performance. The data that has to be entered/selected is for example ….. airport, runway, DRY/WET, AI OFF/ON, AIRC OFF/ON, slope UP/DOWN, PA (Pressure Altitude), QNH, wind, QAT and so on. 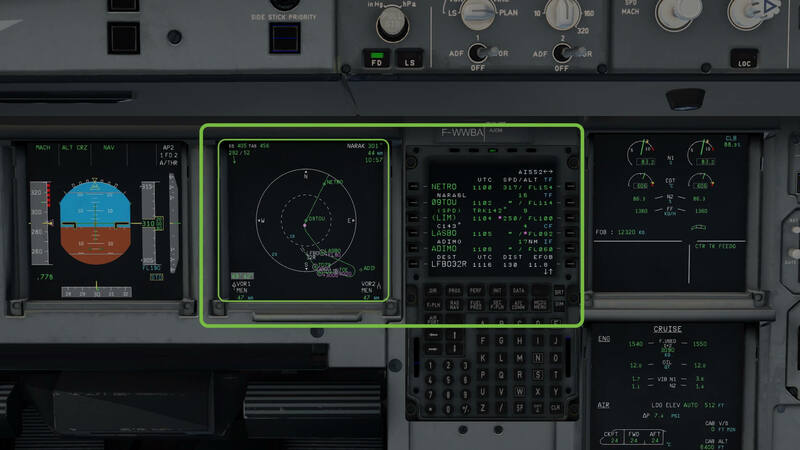 In the case of the FF A320 Ultimate, the EFB is able to transport the calculated ZFW, ZFWCG and block fuel to the INIT B page of the FMS or if you wish the MCDU. As with the real aircraft, the pilot selects the CO-ROUTE or enter the DEP/ARR airports and all the waypoints/airways. The easiest way what I discussed before is creating your own flight plan(s), add them to corte.in and you’ve got your own CO-ROUTE. Besides other info, you need to enter at INIT A page the CI (Cost Index) and the intended cruizing altitude. Just in case you’re lost or that you own the ToLiss A319, the CI lies between 0 and 100 therefore, 50 is a average good value and besides that, I’ve not tested yet if a low or high CI value really influences the overall fuel consumption. I mentioned before the presence of the QRT (Quick Reference Tables) in FCOM Volume 2.02.40. Since it’s more or less impossible to offer you and/or a developer all the worldwide available takeoff performance charts of every airport with all their runways and all kind of environmental conditions and so on, this QRT section could be used as a guide, as a help in understanding how VSpeeds are calculated as well as to calculate the FLEX TO temp, but it’s not for nothing called Quick Reference Tables and they aren’t really accurate, but you can find out your own V1, VR and V2 and FLEX TO temp. Why I brought this paragraph to you, I will explain this in a minute. 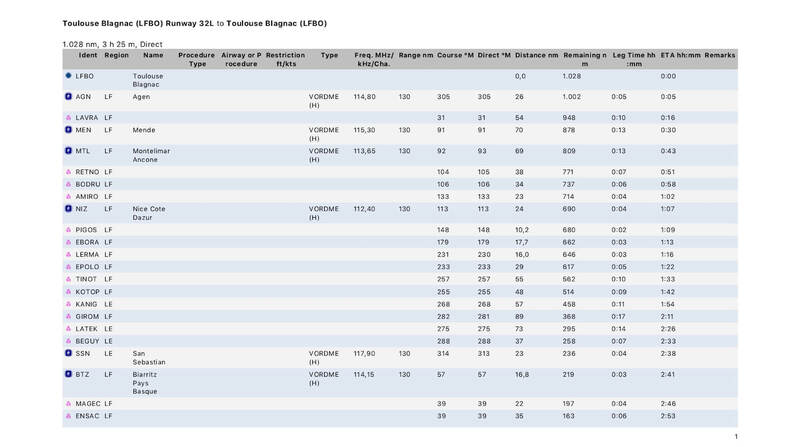 As mentioned before, when you enter via the A320 Ultimate EFB SERVICE tab, sub-tabs FUEL, PAX and CARGO the amount of fuel, passengers and cargo, you can transfer these values into the aircraft. Once you’ve “set” the required value for fuel, passengers and cargo, select the PERF DATA tab and click the “Set” button on the bottom. All data will be transferred to the MCDU. As before discussed, this means that the MCDU receives the ZFW, ZFWCG and block fuel (located at the INIT B page). 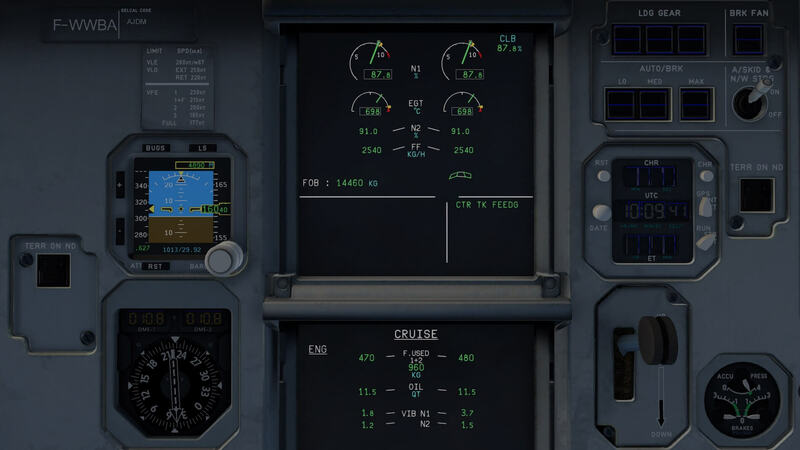 I’ll continue with the INIT page A, enter my flight plan (LFBOAI01), create a flight number (AI1244), enter a CI of 50 (Cost Index), my intended cruizing altitude (310 or you enter 31000). Just to remember, this is based on my created flight plan. In the summary section you’ll find a link that points to a package. The package comes with all kind of files like the corte.in flight plan, the FCOM quick reference tables etc.). Next, select the F-PLN key. Via LSK 1L (<DEPARTURE)) I select runway (32L), SID (AGN5P), but no TRANS since there’s no TRANS available. For the moment I leave the STAR open as well as the landing runway and arrival airport QNH since there’s yet no need for this. I select LSK 6L, followed on the next page LSK 6R. Then I’m back at the F-PLN page and updated my flight plan with a runway and SID. Time to go back to the INIT page thus I select the INIT key on the MCDU keyboard and with the right arrow kry on the MCDU I go to INIT page B. I verify if the data calculated by the EFB is entered (second screenshot). I know you’re aware of this, but in case you’ve forgotten this, keep in mind that INIT B isn’t available with running engines! Clicking the PERF key on the MCDU brings me to the TAKE OFF page. I see that the runway is automatically entered, logically because I entered a runway on the previous steps. I need to enter the FLAPS for Take Off and the THS (Trimmable Horizontal Stabilizer) position. You either select FLAPS 1 (1+F), FLAPS 2 or FLAPS 3. The THS position can be found at the EFB PERF DATA tab. 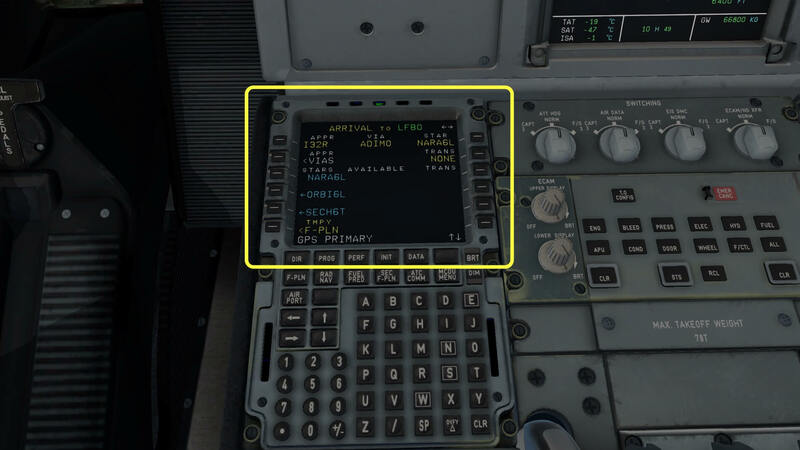 Suppose the THS postion indicates on the EFB 1.5UP, and you use FLAPS 2, you enter in the scratchpad 2/1.5UP. The FLX TO temp (LSK 4R) field is empty, so we need to find out where to get this value, assuming you want to find it out else you can decide to use FULL TO thrust, then a FLEX temperature isn’t needed. On the left-hand side of the TAKE OFF page you’ll see the VSpeeds; V1 (LSK 1L), VR (LSK 2L) and V2 (LSK 3L). 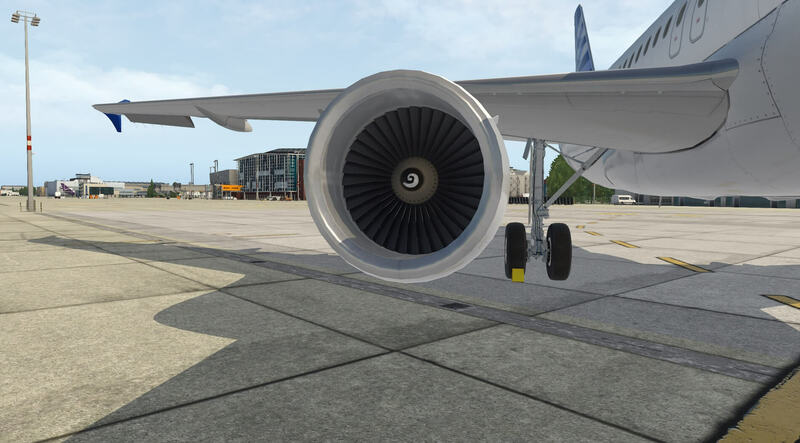 As it is with the current FF A320 version 0.8.79, VR and V2 speeds are entered when you click LSK 2L and 3L, but this is not the case with V1. Checked the VSpeeds and then in particular the V1 speed with Flight Factor Support, but irrespective of how things are calculated or not calculated, the simmer wants to have speeds entered on the TAKEOFF page. Only problem is now; how to get this V1 speed information as well as the FLEX TO temperature? I know that it is more or less impossible to find the most accurate value. Remember what I mentioned before … the absence of the old-fashioned TO Performance charts or the very expensive Airbus OCTOPUS dispatch software. Since we don’t have both, we need to find a value where we can live with. 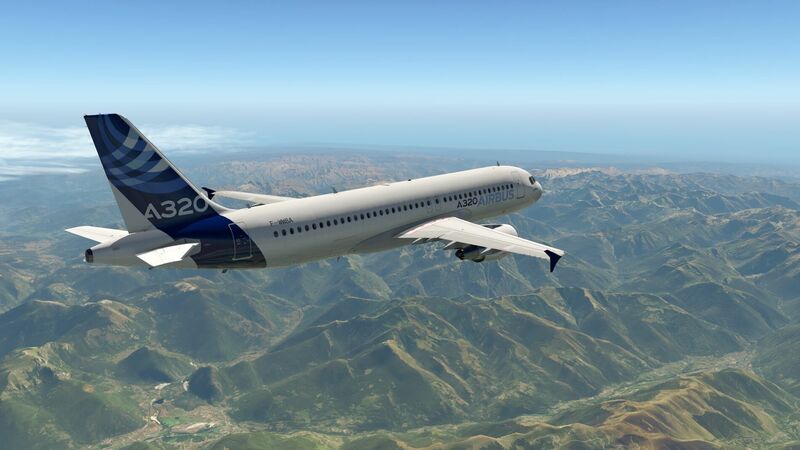 We go back to the previous mentioned QRT from FCOM 2.02.40, but hold on, there’s also another possibility, but this option isn’t really developed for the FF A320 Ultimate, but for the FSX/P3D Windows FSLabs A320. As I said before, the FCOM QRT which I use as example, is from the Aeroflot A320-214 with the same engines (CFM 56-5B4) as simulated in this FF A320. Mentioned before, the FCOM QRT are for quick reference and not really accurate, but you’re able to calculate all VSpeeds (V1, VR and V2) as well as the FLEX TO temp within certain limits. What I mentioned quickly before, there’s also that other option which is accessible via your Internet browser. This TAKEOFF Calculator that can be found via this URL (many thanks Frank for pointing this out), but I don’t know yet how accurate this calculator is. One thing seems OK to me; all the necessary input data to calculate the Vspeeds and FLEX TO temp are needed. Let’s check that out. As you can see, this online TO performance calculator can be used for the Airbus A319, A320 and A321. Under the About tab you find the following information “Take-Off Performance Calculator developed for the FSLABS A320. 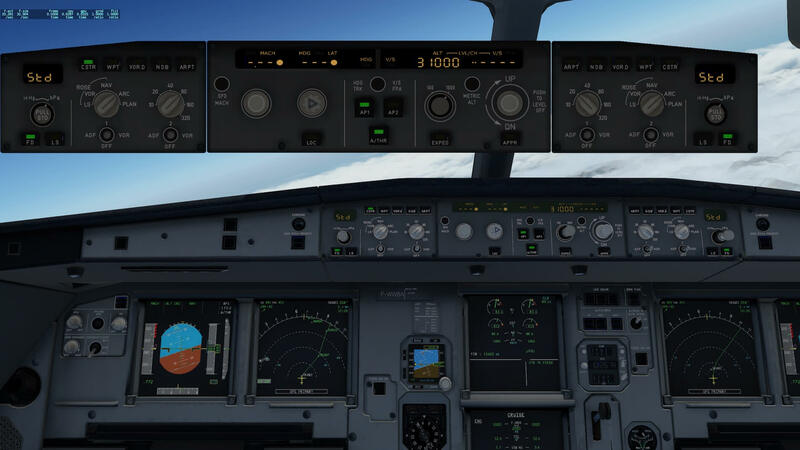 Take-Off calculation can be used with other flight simulator A320 products as well. 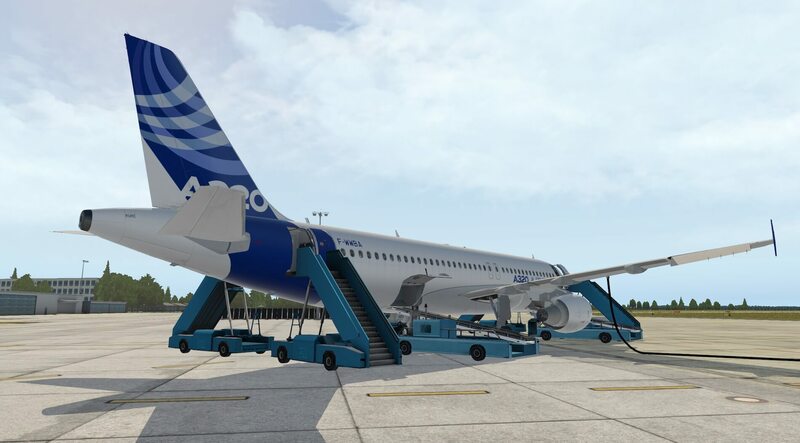 Weight and Balance calculations are valid for the FSLABS airbus only.” Although not officially developed for the FF A320, it says it can be used for other A320 models too. Let’s start from the top to the bottom. 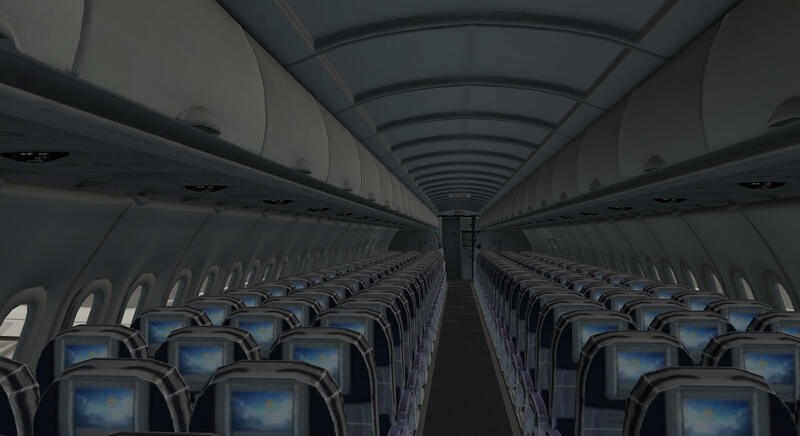 You select the aircraft type, thus A320 and the CFM engine as I did. In the ICAO field I enter LFBO and click on the METAR button. This will retrieve the last and up-to-date METAR information from LFBO. Handy isn’t it? Next I select one of the three options for FLAPS; 1+F, 2 or 3. I go for 2. Further on, I leave the airconditioning pack OFF (PACKS: OFF) during TO, no Anti-Ice (ANTI-ICE: OFF) and there’s no rain or anything else, so the runway is dry (RUNWAY: DRY). Now I take from the FF A320 EFB tab PERF DATA the gross weight value and the CG position. I enter that in the online calculator. You can see, and double check, that the calculator says that this is a THS position of 1.4 UP which equals also what the FF A320 EFB says. One last thing to select and that’s the runway which will be in my case 32L. The METAR says that the wind is 000/3, so the wind comes from the North, but is only 3 knots. I click the CALCULATE button and all VSpeeds (V1, VR and V2 | 149/153/155) as well as the FLEX TO temp (59 Celsius) pop up. 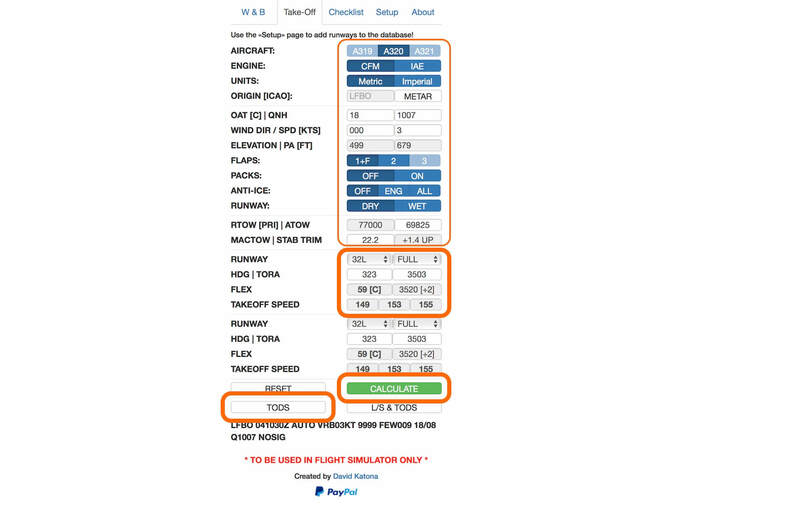 You can if you want to have a printed form, click the TODS (TakeOff Data Sheet) button and a TODS tab is generated. The first screenshot below shows you the data I entered for my planned TO from LFBO. The second screenshot shows you the printed form of the TODS. Another possibility is using the FCOM volume 2.02.40 QRT. For this I consulted Frank Docter and Marcelo Alencar, to advise and to help me. 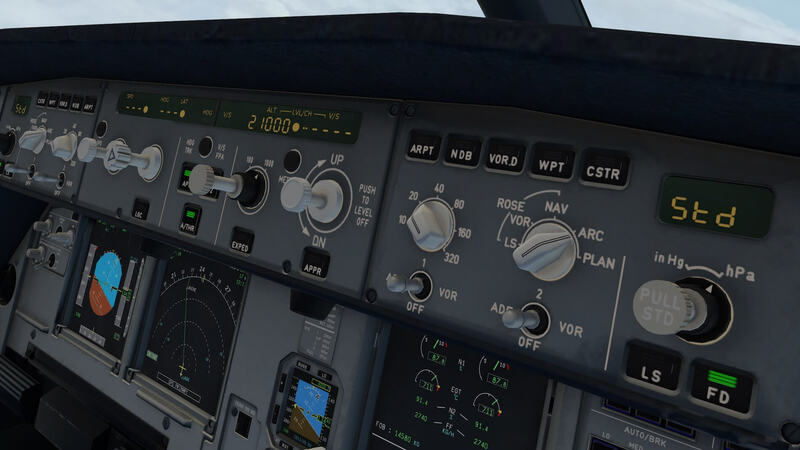 One thing they made me clear is that the QRT isn’t really used by real pilots, but for us simmers it’s a nice way to have a different look and feel in/with the FCOM. It won’t be a tutorial how to use these tables, but I do my best to make it as clear as possible with an example. Airbus offers in this QRT also an example (page 3), but that’s to me and confirmed by the pilots, not as logical as intended! Find below a screenshot with left and right accordingly the pages 1 and 2. Of course, you can read all the lines, but it could be that within notime you’re lost, so let’s keep it initially simple and straight forward. What is important on page 1 is the section “How to Proceed”. I suggest that you read this section, not once, but preferable a couple of times, in particular the items 3 (airport pressure altitude) and item 4 (corrected runway). Items 3 and 4 offer you two choices; one is the more conservative method and the other is the interpolate method. My suggestion to start in the beginning with, go for the more conservative method. Basically, you need to perform three steps to determine the V1, VR and V2 as well as the FLEX TO temperature. To start, you first need to find out the “corrected runway length”. You can make this as complicated as possible, or you first decide to start with that the runway has no slope and there’s no wind. That said, the real runway length in meters is the same as the corrected runway length. Next you need to know the airport temperature. This is a part of the METAR. The takeoff configuration as Airbus calls it, is the FLAP position you’re having in mind. As previously said, this could be 1+F, 2 or 3. Then we need to do one thing and that’s to find out the pressure altitude. I could give you the formula, but I can also surf to this URL. Scroll a bit down and you’ll find an online Pressure Altitude Calculator. You’ll notice that when the pressure at the airport is 1013.25 hPA (or 29.92″), the actual altitude is the same as the pressure altitude. So again, you can make it yourself at the beginning easy by assuming that the actual airport altitude is the same as the pressure altitude because the environmental airport conditions are ISA standard. That this will hardly happen in real is another story! – Airport pressure equals ISA thus Actual Altitude (AA) = Pressure Altitude (PA). – ISA conditions thus 500 (AA) = 500 (PA) | the altitude is a bit roughly since it varies. Now you need to find out the MTOW and belonging Vspeeds. Check once more page 1 item 3 and then the second part that start with “for a more conservative figure, use the table corresponding to the pressure altitude immediatly above the airport pressure altitude.” This means that since our Pressure altitude (PA) is 500 feet, we need to use the table from 1000 feet and don’t forget the correct FLAP configuration thus the table with 1+F configuration. Find below a screenshot with page 3 and 5 of the QRT. 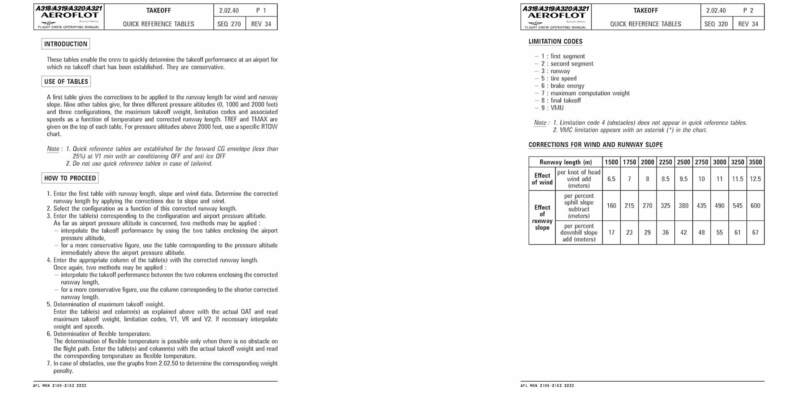 Page 3 offers you the Airbus example … forget that for the moment, but notice the three “determinations” to do. Page 5 is the table we need to find out the MTOW and the Vspeeds. We have to find the cell that fits the 3000 feet corrected runway and the airport temperature (20C). It turns out that this results in a 80.2 MTOW with VSpeeds of 143/153/155 (V1/VR/V2). You also see in this cell in the right-hand upper corner the values 3/6. These are the limitations that can be found on page 2 under “Limitation Codes”. I hope this makes a bit sense and yes, I used the most convenient values I could imagine, but assume that the temperature was not that beautiful 20C, but 25C, then you middle the values between two cells (marked green). That would be then roughly 80.2 + 79.1 / 2 = 79.7 MTOW and for the VSpeeds 142/153/155. I should write for VR and V2 152.5 and 154.5 but that’s unlogic. Therefore, always take the highest of the two! Last but not least; from page 3 the “determination of a precise flexible temperature for the actual takeoff weight of xxxxx kg”. 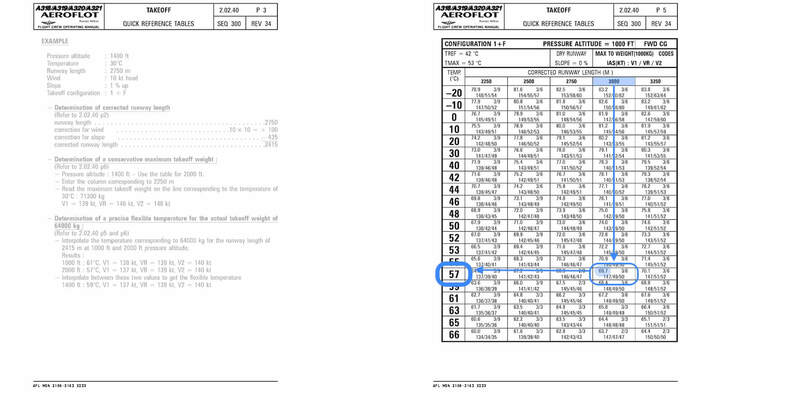 The actual aircraft weight can be found in the FF A320 EFB PERF DATA “gross weight. Assume this is 69800 kg. One thing is for sure … this is at least below the MTOW what we just found, so that’s OK. I used the same screenshot as before, but monitor the blue coloured squares/arrows in the graph. Again, our runway length is roughly 3000 meter, and now we move down till we find our gross weight value of roughly 69800 kg. Just to make it more confusing, this is now the value in the cell that was before the MTOW. I hope you’re still with me, but I’m quite sure you are! It turns out that I found a cell that has a weight of 69700 kg (69.7). I can live with that small difference (69.8 versus 69.7). From here we move to the temperature column on the left and find a temperature of 57C. This 57C is my FLEX TO temperature. I’m aware that you need to read the above once more, perhaps even twice and I hope you got the idea of this “EFB MCDU Preprations” section. The interesting part is that you’re able to use the official FCOM, but immediately it must be said that it’s far from accurate, and it should be noted that the QRT doens’t offer any charts (1+F) with runways longer then 3250 meters. Perhaps you think … nice Angelique, but I go for the online TO Performance Calculator as explained before or you say … what the heck, I just enter my own V1 or leave the V1 empty (suggested by Flight Factor Support) and fill in “a” FLEX TEMP value or I can live without a FLEX temperature entry. All is OK with me, but I felt there was a need to highlight these VSpeeds in general and the FLEX TO temp value. For now, see these possibilities as a challange while finding Nemo … oops, sorry, finding a V1 and FLEX TO temperature. Taxiing isn’t a problem although I did’t hear any rumbling sound while on the taxicenter line. It could be due to the airport scenery or it’s not implemented to simulate such a sound. Before initiating the takeoff, it good to check the ckecklist once more. It sounds so logic, but how often is the checklist forgotten. Also, since you’re sitting alone in the cockpit, it’s a good idea for yourself to refresh the takeoff in your mind including the initial climb and thus what to do. Normally this is split over two pilots, but we need to do it alone. The moment you approach the runway, X-RAAS comes into action. Oops, what’s RAAS? RAAS is the abbreviation for Runway Awareness and Advisory System. It’s an electronic detection system that notifies aircraft flight crews on the ground of their position relative to their allocated runway. Please don’t hit the AP button ones you’re off the ground. Try to fly the aircraft yourself. Follow during the takeoff the YAW bar on the PFD and once airborne, the FD ROLL/PITCH bars. By the way, I don ‘t find the FD bars clearly visible. The popup PFD helps a bit to see where the FD bars are, but it’s not optimal. I think it has to do with the way the green bars are made. When you zoom in on them, there’s a small dark line around the bars and that gives me at least a unclear look of their position. It’s OK when you zoom in on the PFD, but then other contact with the cockpit is lost as well some of the external view. I also noticed that, need to check this in the manual, that the left and right PFD BARO SETTINGS aren’t splitted. This means, when you PULL on the left-hand EFIS CPL the BARO knob, it changes to STD on the LH PFD, but it does this also on the right-hand PFD and what said, I don’t believe this is correct or at least, it’s not simulated as a split system. Either it is me or it’s because there’s no manual that explains this. When you place your mouse pointer on the FCU SPD knob, you either get a hand with an arrow UP or DOWN. By trial and error I figured out that with the arrow UP you push the knob which equals MANAGED mode. Arrow DOWN, then you pull the knob and you’re able to adjust the speed. Changing the value is done by using the mouse wheel or for Mac users with their Magic Mouse, sliding your finger UP/DOWN over the middle of the mouse surface. This SPD knob behavior is basically the same for the HDG and ALT knobs. Keep in mind that when you have both the HDG and ALT in MANAGED mode (dashes with dot except for ALT since that shows you the altitude selected with dot), and now you click HDG knob arrow DOWN (PULL the HDG knob), the ALT dot disappears as well. A trained eye sees this on the PFD FMA (Flight Mode Annunciator). The CLB indication changes in OP CLB and yes, the NAV changes to HDG. Further on, when you turn the SPD and HDG knob “one click” while in MANAGED mode, it will show you the current speed and/or heading. It’s nice that I found it, but this should be in a manual. While the climb continues, and the FF A320 flies in AP and A/THR mode, it gives me some time to highlight something about trimming modern Airbuses. 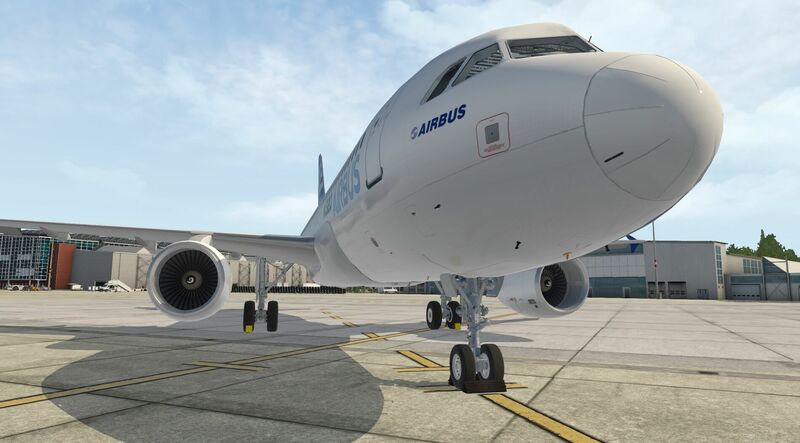 Todays question is … do you need to trim A320 Family aircraft or generally speaking, all modern FBW Airbus aircraft? Do you need to trim for example the ROLL and PITCH channels under normal flight conditions? An interesting question isn’t it! To answer this, I could find it out myself, but it’s better to ask a real pilot, Marcelo Alencar. Marcelo is an active licensed pilot flying for Qatar and yes, he’s an acting captain on the Airbus A350, A330 Series as well as instructor and also flying the Airbus A340-600. According to Marcelo “None of the FBW Airbuses has a trim switch on the sidestick. Airbus has what we call “auto trim” and this is directly linked with the flight control laws. On the A320, A330 and A340 you still have the trim in case you end up using a mechanical backup. There you can see the trim wheels moving, but you can’t interact “command” them. If you degrade to a direct law or mechanical backup, than you can use the trim wheels to control the pitch. This is very difficult to maneuver and as per Airbus, it’s very unlike to happen! On the A380 and A350 the trim wheels are replaced by a pitch trim switch which has the same functionality as the trim wheels but only a lot smaller. Remember; on the sidestick you only have the PTT p/b (Push To Talk switch for the radio) and the red AP disconnect p/b. On all Airbus the information goes to the computer and then to the surfaces. After engine start, you set manually the TO C.G. % using the trim units, applicable for the A330-200/-300 and the old A340. 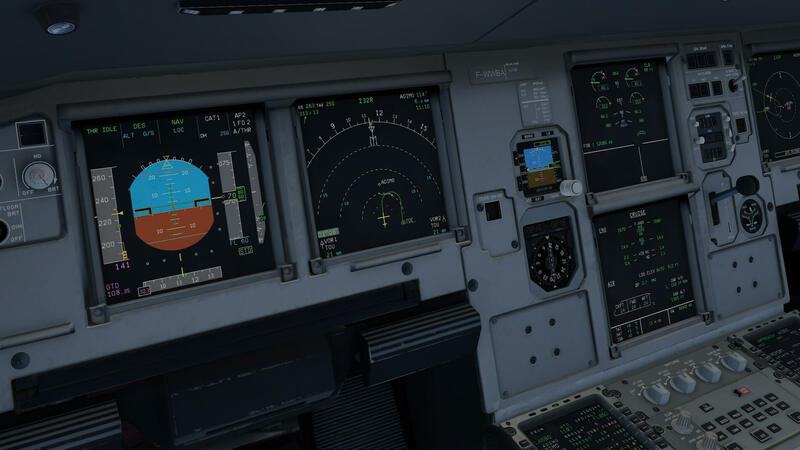 On the new A330F (Freighter) and A340-500/-600, this is automatically done by the computer using the information that the pilot inserts via FMS. After take off there is a transition on who’s is controlling the airplane (what laws are working). You do the take off almost on Direct Law and after approximately 10 seconds the system reverts to Normal Law. At this point the computer start trimming the aircraft based on pitch and speed. During the whole flight, the system looks for the best C.G. based on altitude, speed and weight. It uses, if applicable, the stabilizer TRIM tank to change or improve the C.G. by moving the fuel from the other fuel tanks to the trim tank and of course, some conditions are there to comply. Now that we know this, let me give you what I see and feel about the modeled 3D cockpit. It’s gorgeuos! Yes, that’s it although there’s one thing I had seen before during the many hours of testing the FF A320. I’m quite sure that this has something to do with my AMD Vega Pro GPU driver or perhaps it’s the macOS High Sierra who’s responsible for these blue surrounding lines around buttons and switches. On some of the screenshots below you can see around the switches a blue line/light. No idea what it is. 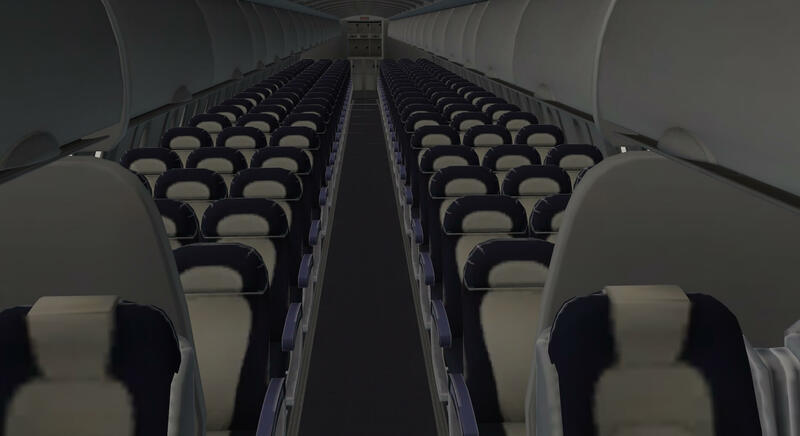 While the FF A320 is approaching my cruising altitude, it gives me also the time to tell you the animations that are included and the many 2D popup panels. Somewhere in the short manual is written that the FF A320 doesn’t come with a 2D cockpit, but it seems that instead the FF team created many individual 2D popup panels. I can’t say anything else … wonderfull feature. The 2D popup panels are of a very nice quality, and they can be resized too. Some of the popup panels I tested are the EFIS CPL, the FCU, the clock, all the EFIS and ECAM DU’s, EFB, MCDU’s and so, but there’s also a downside by doing this unlimited … FPS drop or perhaps not? I can’t say anything about others PC or Mac performances, but I can tell you that even with all DU’s in view (PFD, ND, ECAM E/WD and Synoptic) and having enlarged the 2D popups, the frame rates don ‘t drop! I’m serious and ok, perhaps they drop 0.1 FPS, but it isn’t noticeable. Well done I must say. 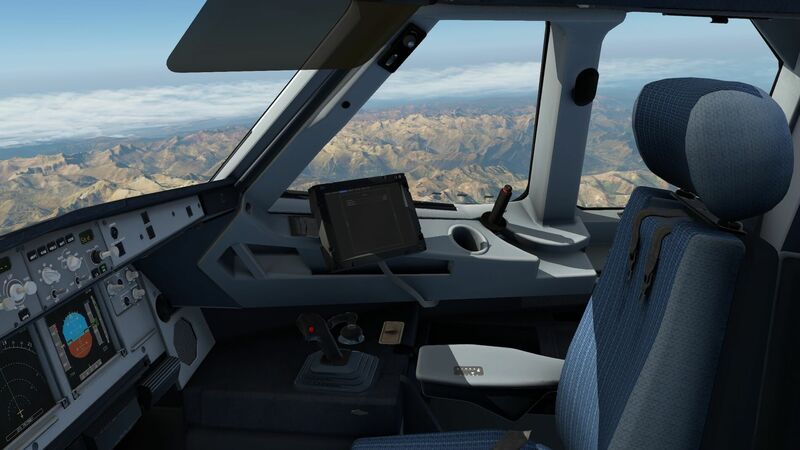 And before I forget the animations; the sunscreens for the windshield panels are animated, the inner armrests of the pilot seats, the left-hand sidestick, the folding tables, the modern version of the compass and the sliding windows. Regarding the sliding windows .. not just opening by clicking the handle and click the handle or window frame to close it …. no no, to close the sliding window you need first to unlock the window before you can close it. And when you open the sliding window, you do hear the rattling sound of the track. I couldn’t find any animations for the cockpit door. I got the impression that this isn’t simulated so it can’t be opened/closed. You and I could ask ourself the question if all those animations are needed or that it’s nice, but preferable a well modeled and realistically flying Airbus, isn’t that of more important? I prefer for the last option, and I think many with me prefer that. As you can see on the above screenshots, I’ve left the Pyrenees behind me. I see the French coastline, and yes, it’s a flight with CAVOK conditions. Did I do that myself .. no, it’s real weather! 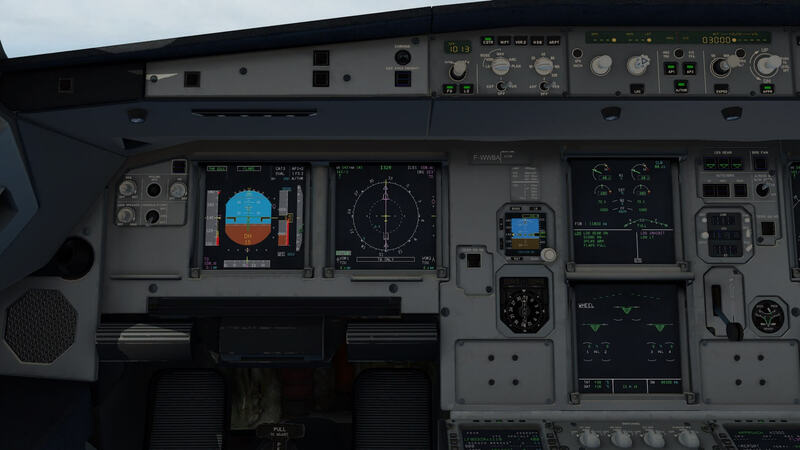 While Andy did already the thorough 3D cockpit check, there’s not really a need for me to do it once more, but it’s worth to highlight that this FF A320 comes with a grey cockpit. It is know that there are light blue cockpits too. 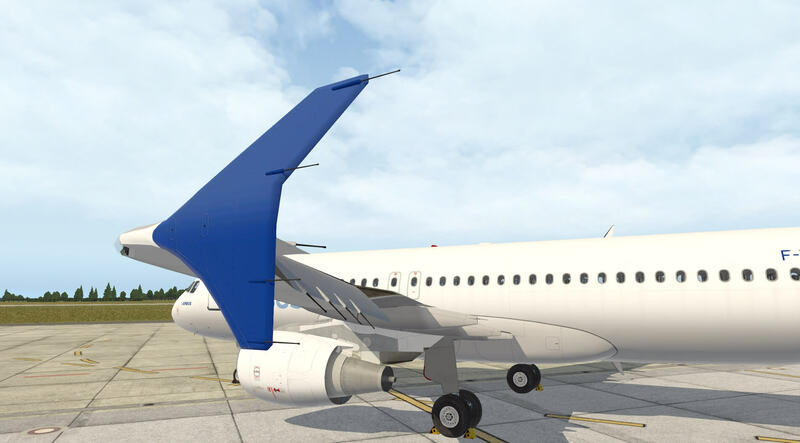 A good example is the ToLiss A319, but since not everybody likes this blueish look and feel, a very nice enhancement pack is created for the ToLiss A319. Back to the FF A320; this cockpit looks absolutely not new, no, it offers some weathering and I think that’s good, at least, I like that I see. The only thing that misses is the smell … just joking! Although I like the cockpit textures as they are, I’m also aware that some simmers prefer a brand new cockpit, but lucky we’re all different. Having a FMS and assuming it works correct, makes life so much easier then without it. 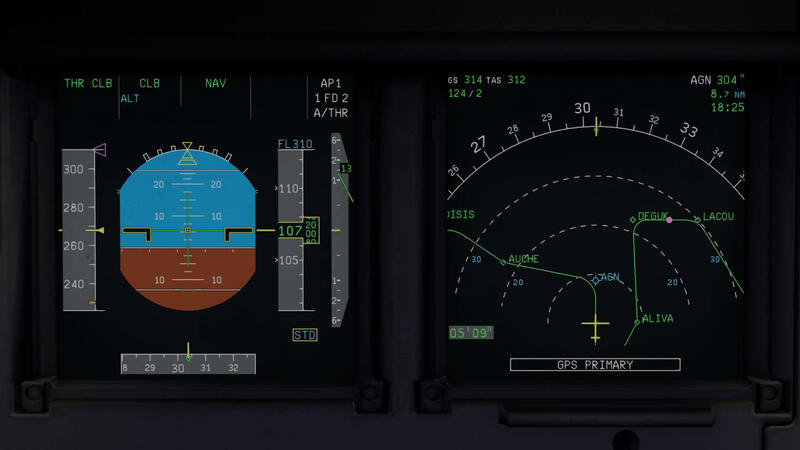 It tells me when we reach the TOD (Top Of Descent), it helps me with the STAR and TRANS, it helps me calcualting the speeds for the approach and so on. When you think about it, you’re wondering why it is said as being a complicated adventure? 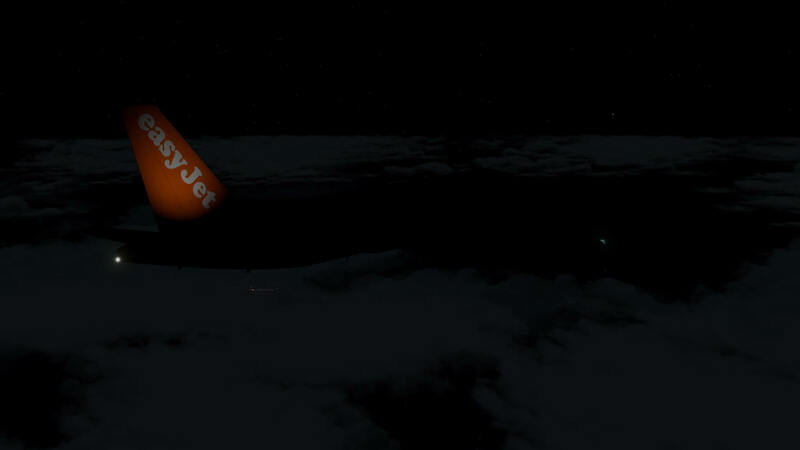 I’m passing waypoint BRUSC on my way to DEPES, where, when I my believe FMS, a bit later my TOD lies. 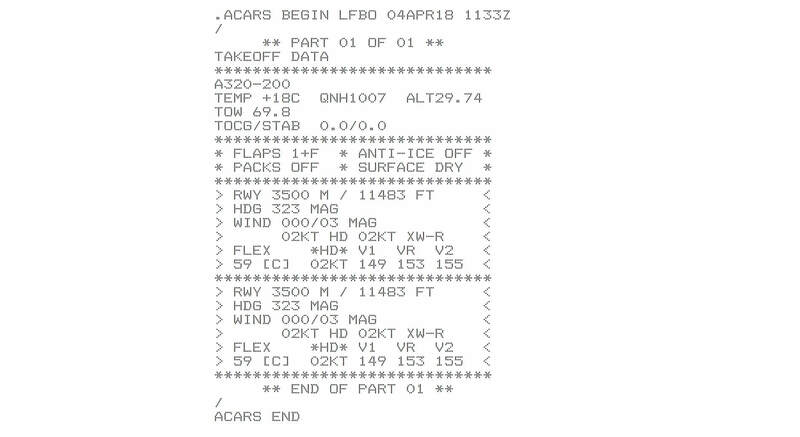 And yes, the MCDU comes up with the following message in the scratchpad “ENTER DEST DATA”, so I think it’s time to listen to the LFBO METAR and enter the necessary data in the MCDU. What and where? When you had a tutorial, it was much easier. Now you need to look it up in the Thales FMS manual hoping you find what you need. 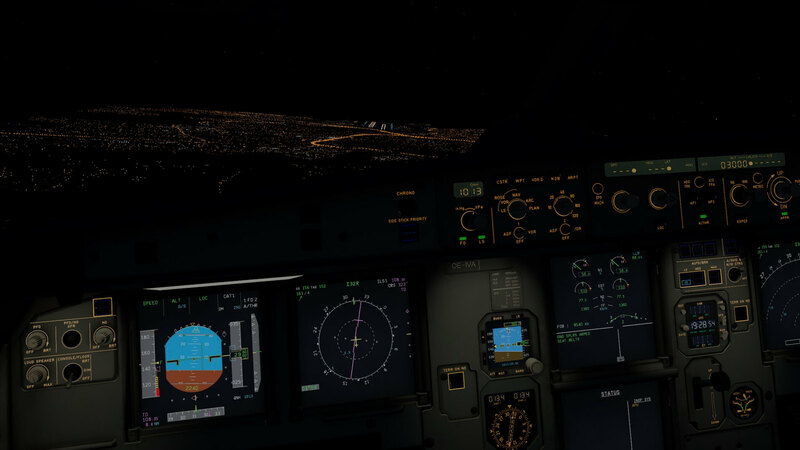 Mean while, I set the ALT indication to FL190 MANAGED. I could set it lower, but for the moment we should be at NARAK which is the next waypoint after DEPES, at FL190. I find it a good idea, something I’ve learn from pilots when I flew with them as ground engineer on the A310-200, to verify myself by selecting the PLAN ND mode, and scroll thrue the modified flight plan with SID NARAK6L and TRANS NARAK6L and see if it looks OK on the ND and if there are no “DISCONTINUITIES” added. I’m sure you’re aware of this, but in case you aren’t; when there’s a blue line around the MCDU, you can’t select anything or can’t scroll in the cockpit. Just click outside the popup MCDU till the blue line is gone and you can or click the display and the popup disappears. This is the same for the EFB. Oops, almost forgotten to mention; the APPR page. With the METAR received, I’m able to enter the necessary data on this page like QNH, temperature / wind, DH and FLAP (by default at FULL). Runway is already taken from the ARRIVAL settings which I entered/selected before, so the only thing that’s left, is activating the APPR PHASE on the DES page. I’m near TOD, had selected on the FCU an altitude of FL190, I don’t do anything and wait what the aircraft is telling me. At TOD, the PFD tells me that I need to DECELERATE and I also need to descent. Now it’s time to click the ALT knob and double check that the FMA shows DES and not OP DES. We need to drop roughly 12000 feet in a relatively short time. It could be that we’re presented with a message to introduce DRAG, but lets wait. It does a great job during it’s descent. The V/S is kept within normal range – 2000 to 2200 – and the speed is within the brackets. The aircraft descents to waypoint NARTAK and should end at FL190, but the moment we reach NARAK + 3NM, we’re at FL200. Not bad to be honest and no problem for the rest of the descent to go. 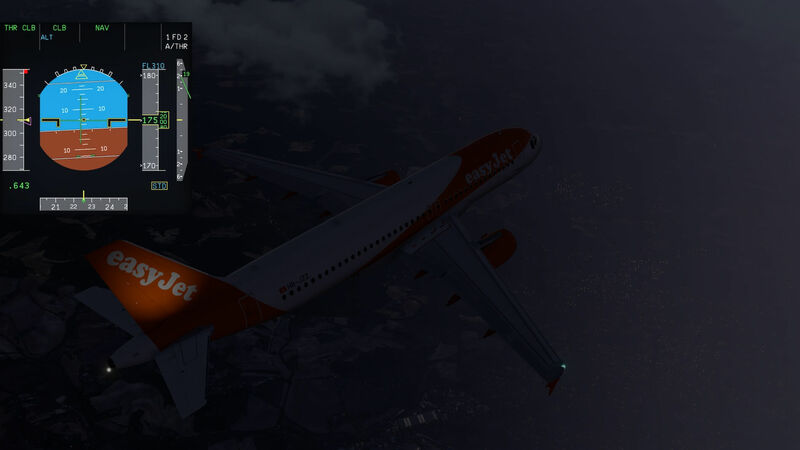 In the mean time I’ve set the ALT to FL060 which is the altitude for waypoint ADIMO. 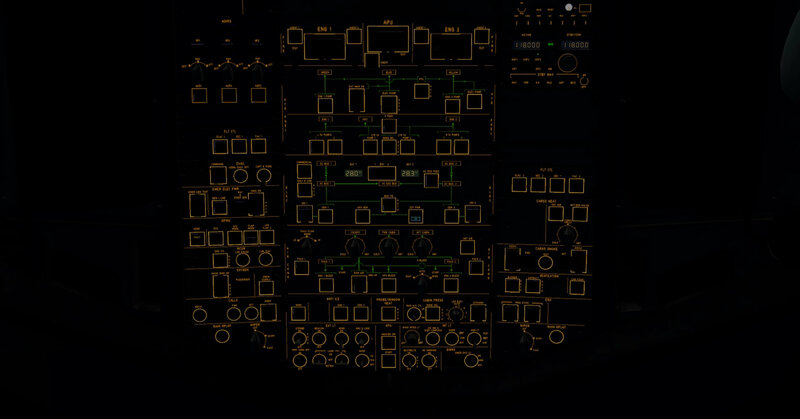 Look on the chart … ADIMO is a part of the STAR and after ADIMO we’re making a more or less 180 turn for runway 32R/32L. In the last part of the approach there’s always a lot going on, and a lot to see. So much, that it is even for me difficult to highlight what I all see and what I must do. Before ADIMO I had already ACTIVATED the APPR PHASE. Then at least I don’t need to worry about my speeds. Near ADIMO I select the LS and APPR buttons on the FCU and the co-pilot switches his/her ND from PLAN to ARC while I, on the left-hand side, switch the ND to the ILS ROSE mode. 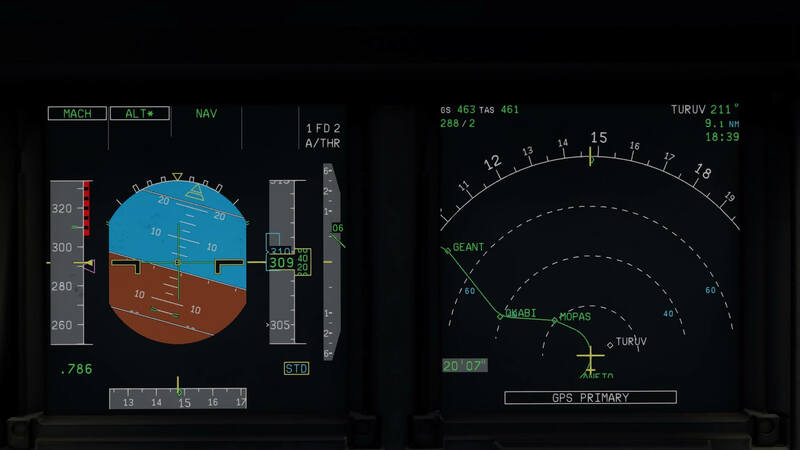 On the PFD I notice that a valid ILS frequency is recognized from the FMS database, the FMA shows me in cyan G/S and LOC, DH is visible on the PFD as well as that the ILS bars are also in view on the PFD. 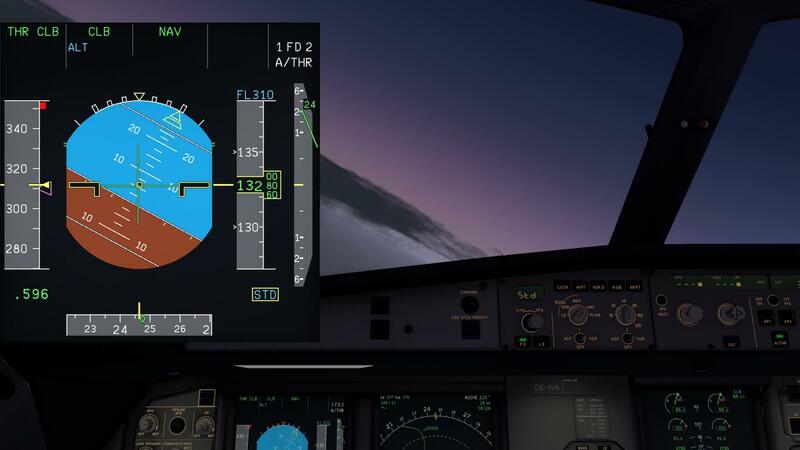 The aircraft has reached its altitude of FL060, so we’re leveling OFF and the current speed is the green dot speed. This speed or the value can be found on the APPR MCDU page. Seems to me that all looks OK.
By the way, when you see during the descent on the FMA left side THR IDLE ….. keep you fingers OFF from the thrust levers. Leave the thrust levers where they are! The FADEC, in corporation with the FMGS, controls the actual thrust to the engines. Sounds a bit scary, but it’s a beautiful system, as long as it work fine! Oops, I made a mistake. We’ve just passed ADIMO and heading for TOU, but I didn’t look good enough on the MCDU. We need to be at 4000 feet for TOU. I may have forgotten this, but it’s good to see and test if the system is well programmed and with my knowledge, it does what I expected. I select 4000, I click the ALT knob for DES mode, but the FMS thinks that with the intended V/S it will take too long and therefore, both on the PFD under the FMA and in the MCDU scratchpad, MORE DRAG is indicated. I select speedbrakes to increase the DRAG and see what happens. Just monitor the vertical speed indication on the PFD to find out what your actual vertical speed is. 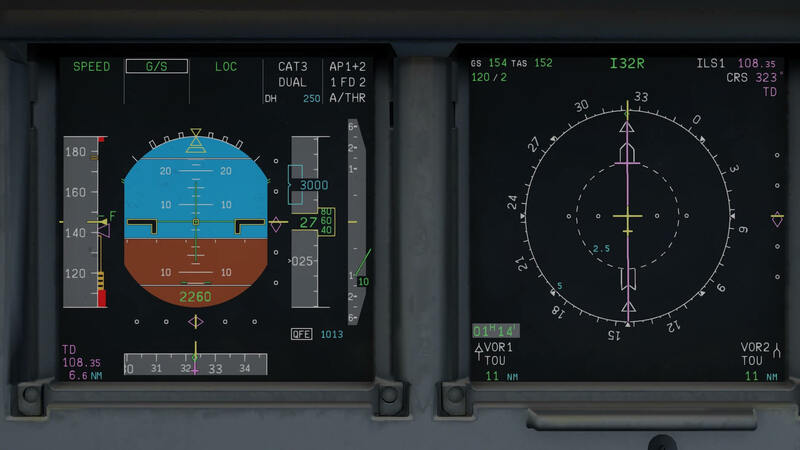 While the aircraft descents to 4000 feet, I noticed that the PFD FMA shows CAT 3 SINGLE. This means a CAT 3 landing is planned, but with a single AP. I want 2 AP’s! Normally this isn’t possible. Only one captain can be the captain on a ship, not 2 captains! The same on an aircraft. I can get 2 AP’s connected or better to say selected what is known as DUAL AUTOLAND, but then still only one AP is active (MASTER), while the other AP is standby (SLAVE). It is following all the signals/commands that the active AP is doing. When the active fails for some reason due to internal tests, the other AP takes over in a split second and since that AP followed every move, you won’t see the difference except for indications. The last turn is made, the localizer is captured (LOC*), that becomes later LOC and not long after that I get G/S*, followed by G/S. And …. have I seen something that’s not OK or something that feels odd. No, nothing. All indications and aircraft behavior are, as far as I know, are expected. At 400 RH (Radio Height from the Radio Altimeter), the FMA indication changes from G/S and LOC to LAND. A bit later I hear the aural MINIMUM in the cockpit. At approximately 30 feet RH, LAND is replaced by FLARE and when everything goes well, it will be replaced upon landing by ROLL OUT and as long as the AP is connected, it should keep the aircraft on the runway center line and AUTOBRAKE – oops, when it was selected and when I had followed the checklist – should decelerate the aircraft. Lucky for me …. you can always at any moment select an AUTO BRAKE mode which I do by selecting LO. I select ENG REVERSE THRUST and apply a bit of power. Just as a reminder …. 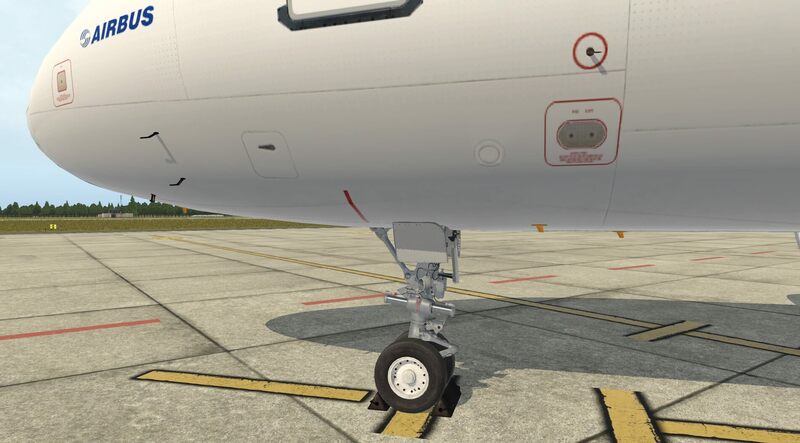 the green DECEL in the AUTOBRAKE LO button only indicates that the requested deceleration rate of the aircraft has been attained. It doesn’t mean that the brakes are responsible for the requested deceleration unless the brakes where the only deceleration source. Perhaps you haven’t noticed it or perhaps you have, I used a different flight plan then intended. I used the same flight plan I also used to test the ToLiss A319. Not because it’s a much shorter flight thus less time consuming, but for myself more to see what is different then what I have seen with the ToLiss A319. 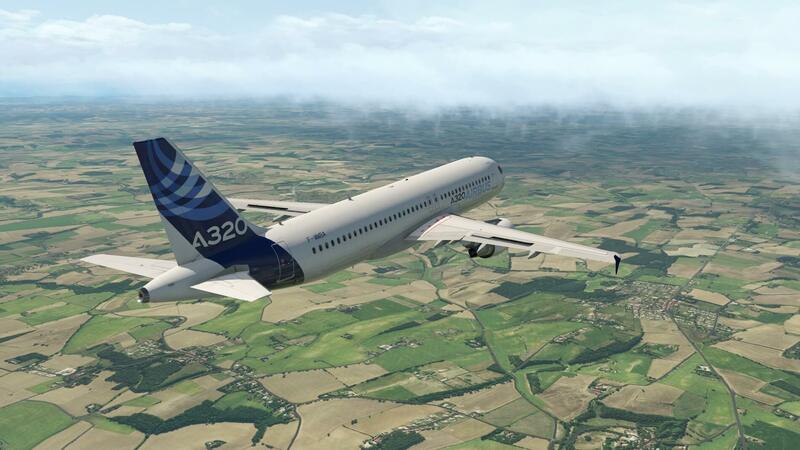 What I can remember from the ToLiss test flight that the FF A320 didn’t behave different. Indications are the same or close to each other as well as the aircraft behavior during takeoff, climb, cruise, descent, approach and so on. So far, what’s my overall impression? 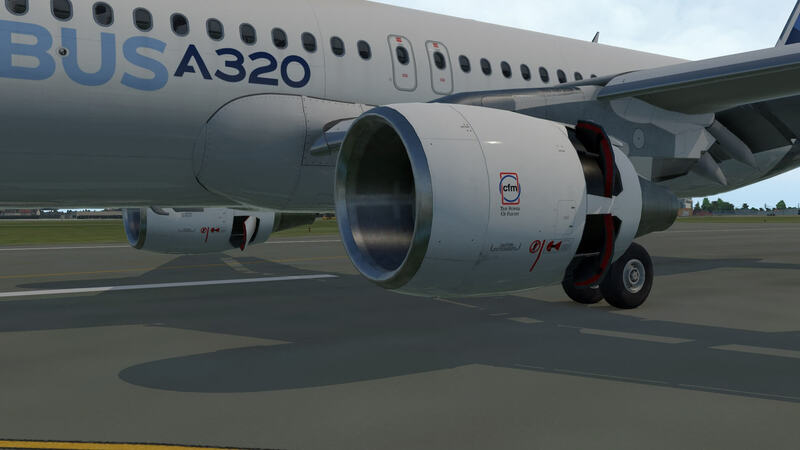 I have read many forums where simmers have good words for the FF A320 and some say … no no, give me the ToLiss A319. There was even somebody who compared the FSLabs A320 with the Flight Factor A320. To me this is a useless comparison since that’s comparing the FSX/P3D Flight Simulator with the X-Plane flight simulator. 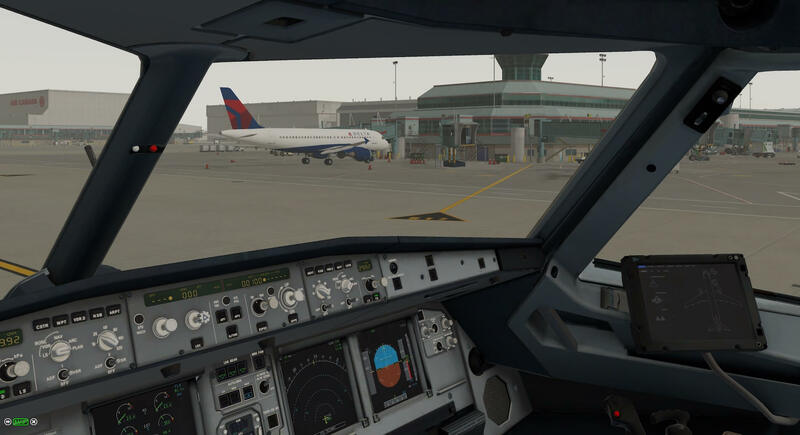 Whenever you want to compare something, keep it on the same flight simulator platform! Reading all of those forums doesn’t bring me much further. Simmers have their own preference, and their own words and thoughts. So, the only way to judge is reviewing the aircraft myself and I must say, I’m positively enthousiastic. Is that good news … yes, it is good news! Some words about the frame rates. It must be a part of the review and perhaps Andy has also written something about this, but it’s good when I add my own experience although I must immediately admit that my iMac is a bit overpowered and therefore not very representative for other older Macs and/or older PC’s. I won’t show you frame rate figures, but I can tell you that I’ve got the feeling that the FF A320 uses frame rates as every other add-on aircraft does, but it’s not demanding as you would expect. Think about my test flight where I made several screenshots with the 2D popup panels and DU’s. Amazing that with or without these popup windows, I didn’t notice any frame rate loss. Whatever, for such a complex aircraft I’m impressed by the actual frame rates. Want to see some more exclusive screenshots? 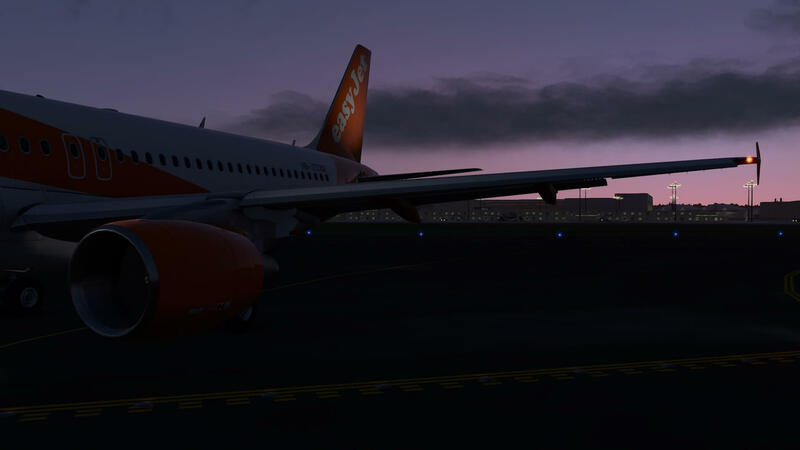 Then I would suggest that you have a look at our dedicated FF A320 screenshot collection link. 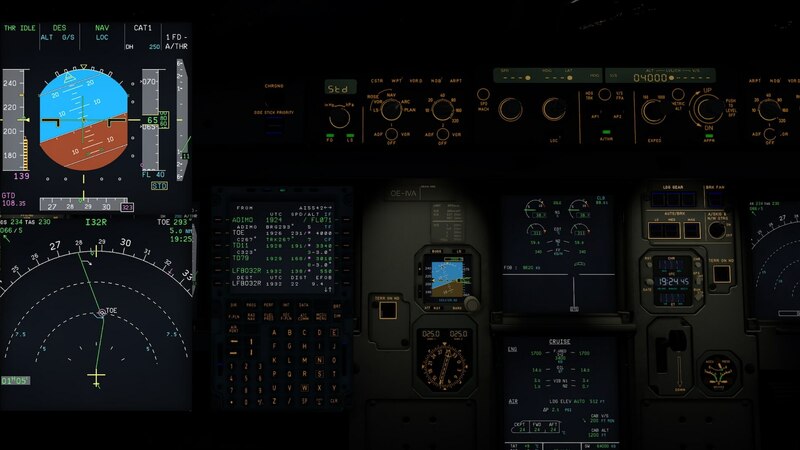 (https://www.x-plained.com/exclusive-screenshot-flight-factor-a320-impression/) Besides the huge amount of screenshots, it also offers some sunset and evening internal and external photos. I didn’t mention yet anything in the review, perhaps Andy does, about the look and feel of the FF A320 night lighting and then in particular the panel integral lighting and lower glareshield lighting. What can I say, it looks great and for sure you’ve got the same idea as we have. I decided to make a second test flight. Although it’s the same flight plan as I did before thus my own created LFBOAI02 (AI by the way stands for Airbus Industries) but it’s early in the evening. What’s then different? I’ll try to look around while flying and see if I notice other behavior then on the first flight – for sure I have missed things which I can double check once more – and I would like to fly the aircraft manually, in particualr when I have set a STAR, TRANS etc. Let me see how this flies when the AP isn’t in control. I leave for the whole flight the A/THR ON, but once and a while I disconnect the AP, but although the AP is disconnected, the SPD, NAV and ALT mode are still in managed mode. The only thing I need to do is to follow the FD commands. The first thing I noticed during my cockpit preparations is that the APU has a FAULT. 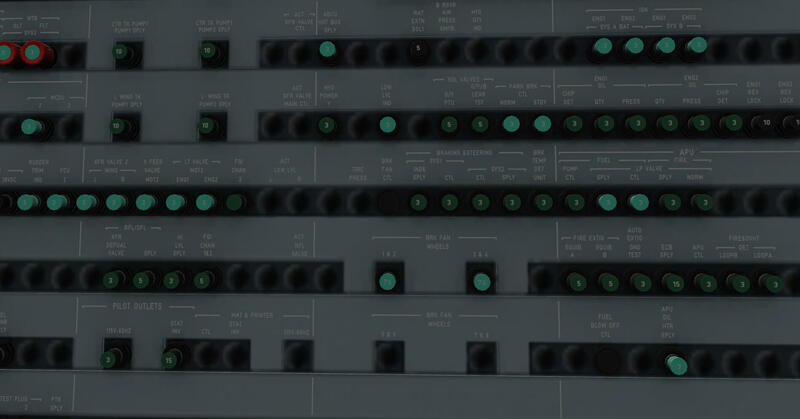 Normally I would read out the APU ECB (APU Control Box) via the CMS (Central Maintenance System), but no idea how to do this and perhaps it’s not simulated. I was almost ready for takeoff thus the only thing I could do, is taxi back to the Airbus handling ramp, ask maintenance to look for it and then I hope they can repair it. If not, we leave without a serviceable APU. The fact that the APU didn’t do anything gave me also the possibility to start the left-hand engine via the JET STARTER or external HI PRESS BLEED AIR. Left-hand because the external bleed air connector is located left of the BLEED X-FEED valve. Anyway, that worked fine and I started my other engine via the same external bleed unit although another option was using a cross bleed start from the LEFT to the RIGHT engine. Officially, you and I should have a look into FCOM 3.04.70 pages 6 and 7. Those pages deals with the “ENGINE START WITH EXTERNAL PNEUMATIC POWER” and “CROSSBLEED ENGINE START”. I would like to highlight that normally first the right-hand engine is started, then the left-hand engine. When all of this is done, time for the planned takeoff runway 32L. This time I noticed during takeoff that missing rumbling sound from my previous test flight. Another thing that is missing in my humble opinion unless I do something wrong; there are no takeoff speed callouts. That said, you need to check during your takeoff the VSpeeds on the PFD. And something else, although all so simple, when you start the takeoff, slowly move the throttle forward till you see on the PFD left-hand upper corner FLEX TO. It’s a bit fiddling around with the throttle to get it at that position unless you go for FULL TO thrust. For the rest, try to keep the Airbus on the runway centerline with the help of the yawbar on the PFD. Suppose you don’t have the yaw bar, then most likely you haven’t selected a runway in the MCDU. During the initial climb, just look closely to the PFD and monitor what is changing, retard the throttle to THR CLB, yaw bar is replaced by PITCH and ROLL bars and just “follow the needles”. Monitor also the F (FLAP) retract speed as well as a bit later the S (SLAT) retract speed, at least, in my case. I had a takeoff with FLAPS 2. After a while you need to click the BARO KNOB to change to STD. When you disconnect the AP, don’t be trilled …. the MASTER WARNING light and an aural warning are visible/heard as well as on ECAM you see a red AP OFF message. It stays there, no problem since you disconnect the AP yourself or actually, I did it as an example. Just click the illuminated CLR button on the ECAM CTR PNL. 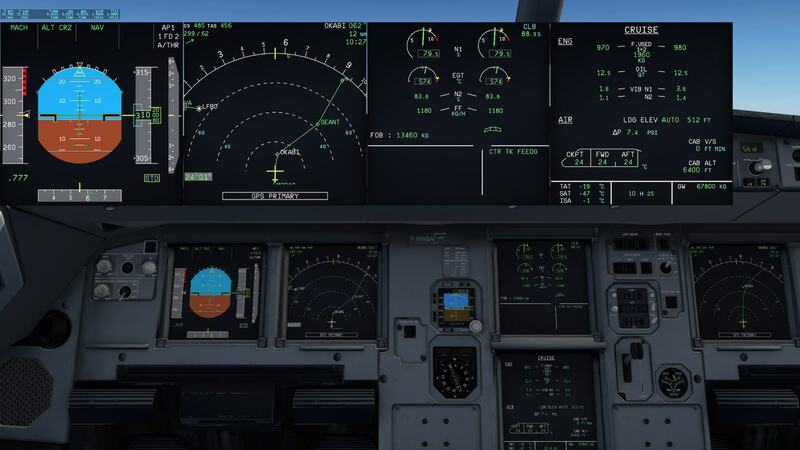 While typing this paragraph, I’ve disconnected the AP thus I’m flying or trimming the aircraft myself, but remember what I wrote in a previous section, trimming on the modeled A320 means you move the stick. Inputs via the stick are send to the AutoFlight system and they control the flight controls. You’ll be surprised how much corrections are needed to keep the PITCH/ROLL bars in the middle. With the AP connected you will never see these small corrections. 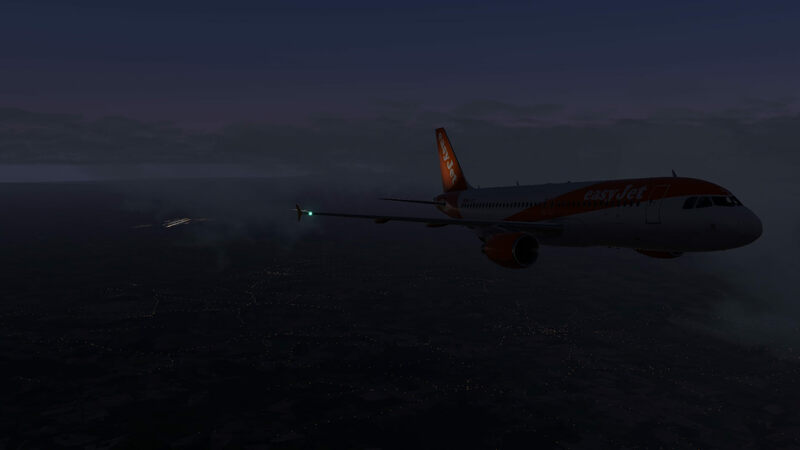 A good training to learn to fly the FF A320 and you’ll experience yourself how easy it is. I didn’t ask my pilot sources about this, but I can remember from a while back that flying Airbus FBW aircraft isn’t so difficult as old fashioned aircraft. 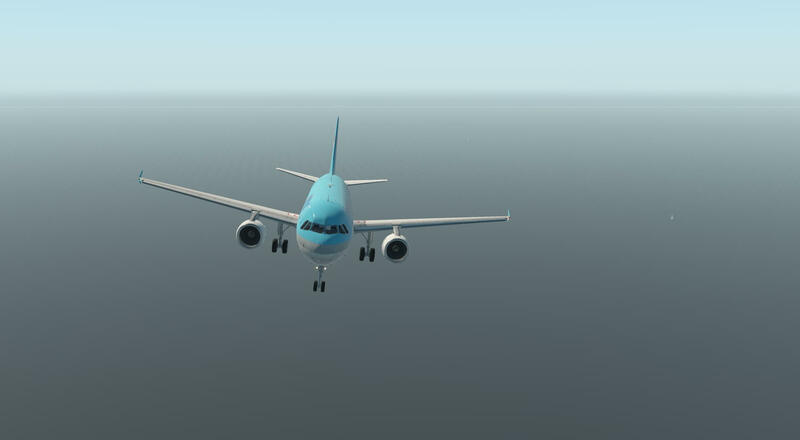 Climbing out to my cruising level of FL310 by hand goes very easy. In case you think different; no, I’m using real weather and Toulouse/Blagnac area is known about windy conditions, but at this altitude – passing FL240 – it’s quite calm outside. I know it’s calm since I hardly need to make any steering corrections. Neither less, it’s fun to see how this flies. With both EFIS DU’s in external view, I’ve got a lot of fun. Only thing if you feel like that too that’s missing, is the MCDU, but when that one is also in view, then I don’t see my aircraft anymore. As you can see on the following screenshots, I’m approaching my cruizing altitude. Still all by hand, but I can tell you, in case you try it yourself, once you’ve leveled off at FL310, it’s not easy to keep the altitude at 31000 feet. How concentrated you are, a small joystick movement is already enough for a bit climbing or decending. When you’ve connected the AP while at FL310, you’ll noticed nothing. This is the same as I know from real Airbuses or perhaps it’s better to say from real digital AP’s. They are so accurate and so fast, faster then we ever can be. While approaching waypoint BRUSC it’s time to do the necessary approach preparations. On the ND I spot that the TOD (Top Of Descent) is just after waypoint DEPES. I listened to the METAR, my intended runway will be this time 32R, STAR NARAK6L (same as previous time) as well as NARAK6L for the TRANS(ition). Oops, before I forget it. Since the amount of characters in the MCDU aren’t limited, NARAK6L will be indicated on the MCDU as NARA6L. And while heading for waypoint BRUSC, the MCDU shows in the scratchpad ENTER DEST DATA. Ok, let’s go for it and let’s enter all the data I need. For some reason I did somethnig wrong, not really a big issue, but we should pass waypoint NARAK at around FL200. As it looks now, that will be a bit higher, but is it a problem. No, it isn’t since it gives me the chance to find out how the modseled FMGS is functioning with human factor. I get a MORE DRAG message on my PFD. Good, that means SPEEDBRAKE and the Airbus starts descending in a rapid speed. But what happens with fast descents, the IAS increases, but it is controlled. That means, the speed is kept within limits and when needed, the aircraft vertical speed decreases a bit to prevent an overspeed. I’m impressed what I see. The modeled FMGS is, as far as my knowlewdge goes, and as far as I’ve checked the procedures, doing a good job. Does it do a perfect job, does it do a job as the real aircraft? Sorry, but that’s something only real Airbus pilots can answer. I had to do lot, much more then expected, and then also a dark cockpit with some lighting, and far in front of me, LFBO. I make a couple of screenshots, and at the end I made a succesfull landing. Where the indications different then with an AP connected? What I said before, no AP, but still I’ve got the FD. Ok, in the FMA you see only CAT I, no CAT III or nu DUAL, but on the other hand, you got LAND, FLARE and ROLL OUT. At the end …. I had a good flight. It was a good idea to do that first test flight once more. 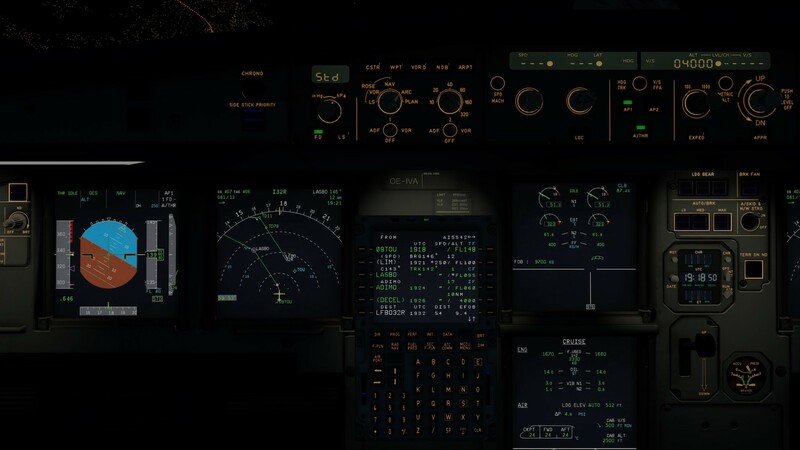 It gave me a new look, it was evening, but it also gave me the opportunity to check all the systems once more and I tried to fly more manually as well as flying the FF A320 during the STAR and final approach. Final approach isn’t easy to be honest. You have to watch out that you don’t oversteer to keep the FD in the cross. Before you know, you give too much input and feel that this goes wrong, but try to correct eith your mind and don’t look to the runwat lights, just look to the PFD and watch closely the FD! The aircraft manual explains that the sounds used with the model are not from the X-Plane system and the model has its own sound engine that allows the use of custom sounds. Within the flight deck the switches, buttons and dials haver their own sounds and the flaps lever, for example, has a realistic ratchet noise on movement. Whilst the controls respond well with their own sounds a click anywhere within the flight deck produces the noise applied for switches. Warning noises are clear, and cant be missed! Engines sound very good and the volume reacts well to throttle inputs and the tone and sound changes with wind up and wind down of the jets. The engine volume changes from inside and outside the aircraft. Whilst in the flight deck the movement of control surfaces is clear and the undercarriage can be heard giving a reassuring noise when moved. The aircraft has its own electrical hum, which all those who travel as passengers on commercial airlines will be familiar with, and the background noise and the initiation of systems adds to this. The services available to the aircraft include the GPU and Air Starter Unit and these add their own bespoke sounds when in use. The sound package with the model is very realistic and convincing. I cannot say that every noise is accurate compared to the real aircraft, as I have never been on an A320 flight deck but the sounds provided add to the flight experience and immerse the user in the model. This has become a much longer review then expected. Not only because the review is written by Andy Clarke and Angelique van Campen, but also of the things we’ve decided to highlight. 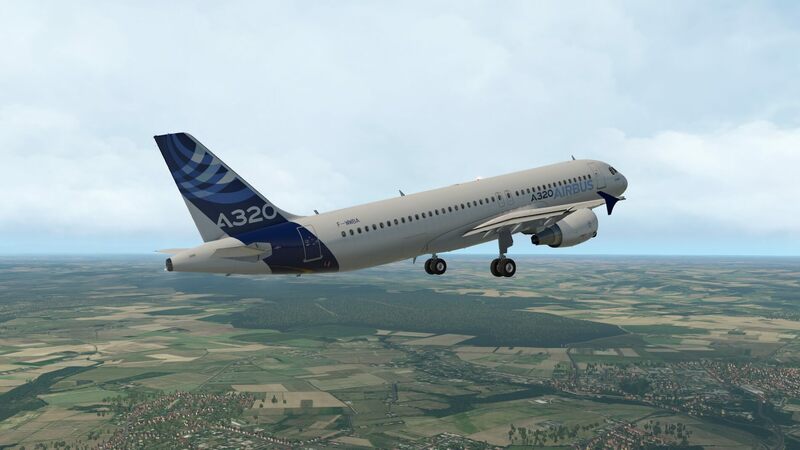 I hope it has given you an in-depth look of the modeled FF A320 and that a couple of things need further improvement of which the manual and/or tutorials are of the first priority! As I’ve said many times, writing reviews from commercial aircraft is difficult, especially when you’ve got no own flying experience on this or that aircraft. 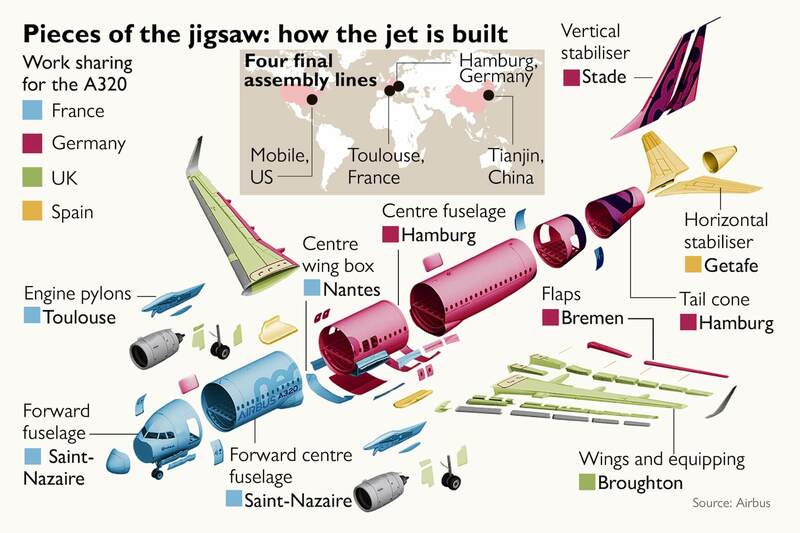 Aircraft these days like this Airbus model are quite complex. Many systems interact with each other and sometimes it’s not easy to find out which system is doing what for another system. 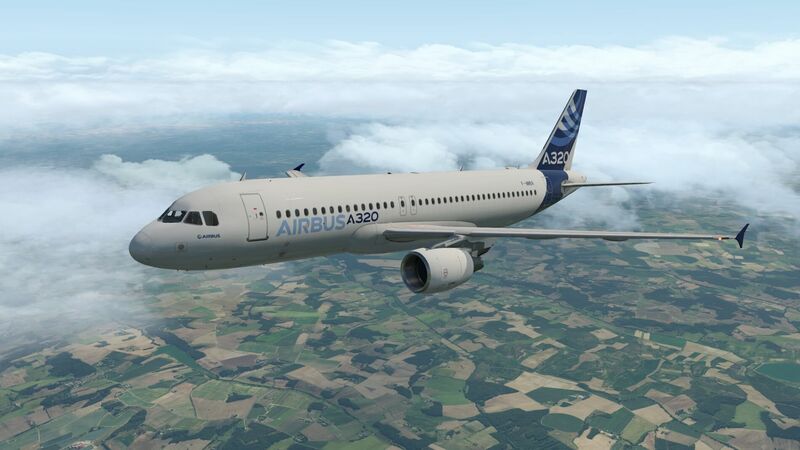 The FCOM is a good source for both the developer and the simmer, but it is in my humble opinion not enough to model an aircraft like the A320 or any other modern aircraft. Developers should have access to a Level-D FFS (Full Flight Simulators), but that’s very expensive. Also contact with, preferable real licensed A320 pilots is a must. But having access and understanding of the AMM (Aircraft Maintenance Manual) and ASM (Aircraft Schematic Manual) are essential for developers in my humble opinion. You would say … Why? The AMM and ASM are the manuals, oh, sorry the bibles for maintaining the aircraft, but they are also used by the engineering department. These manuals offers a much more in-depth explanation of systems, how they work and how they interact with each other or how they are connected to each other. 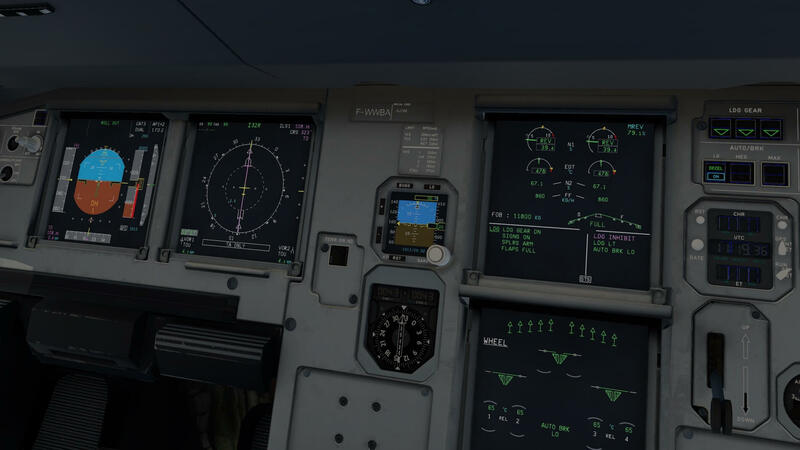 Although many computers that are used in the A320 are no longer analog, but digital, it still gives more information then being available in the FCOM. Keep in mind that the ultimate model is more then only how it looks like, how systems are simulated and how performance charts is implemented. And don’t forget one very important question …. can an X-Plane simulated aircraft model be of the same in-depth system simulation as a real Level-D FFS? 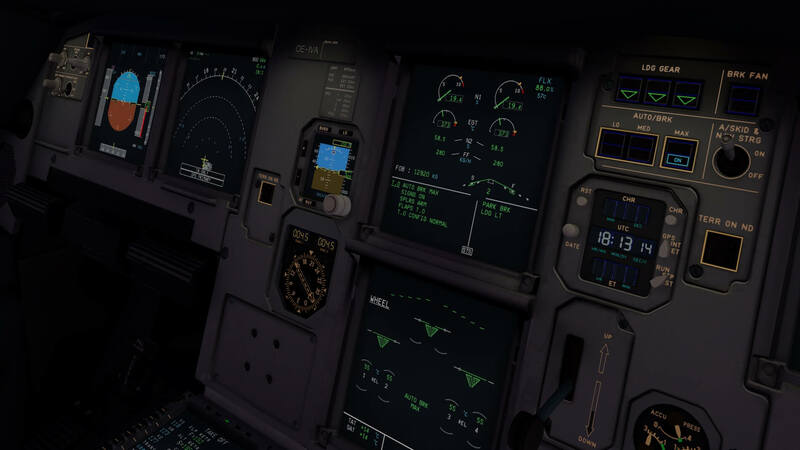 I’m aware that a Level-D FFS is besides the expensive software that is simulating the real aircraft behavior in all aspects, a FFS is also a piece of hardware which is expensive too. A CAE (Canadian Aviation Electronics) Level-D FSS A320 costs quickly somewhere between 15 and 25 million Canadian Dollars! 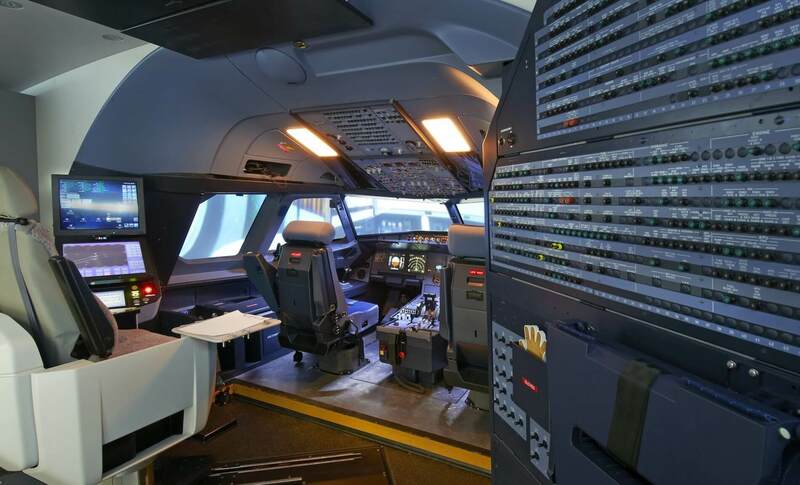 I’m not a programmer, so I can easily talk, but I have aviation maintenance and aviation instruction background and understand the importance of real Airbus pilots inputs and their advice. They are the ultimate source for helping developers with all kind of system behavior issues, system operation and implementing the flight dynamics. Nobody knows the aircraft better then these real pilots. They know how the aircraft behaves on the ground, in flight, under abnormal situations and how the systems interact with each other. I had the privilege to get in contact with Marcelo Alencar and Frank Docter. Marcelo is an active licensed pilot flying for Qatar and yes, he’s an acting captain on the Airbus A350, A330 Series as well as instructor and also currently following a Airbus A340-600 training. Frank Docter, an active A320 pilot, working for a large European company, is also following at this moment an A346 training. Many thanks guys for your help and input! It’s much appreciated. If this aircraft model is “the” ultimate representation of an A320 is difficult to say. Sorry that I can’t give you a better answer. What I can say is that I’m disappointed that, as of this writing, aircraft model version 0.8.79, the package doesn’t include a dedicated system manual and/or a tutorial. Especially the missing tutorial is a big problem. Without a tutorial or guideline, in my opinion, it’s very dfifficult to know how to handle the ultimate Airbus. You have a checklist, but that’s not enough. Without good manuals it is not really an aircraft for beginnners although you do have the option to start the aircraft with engines running. As mentioned before in the review, that Flight Factor offers some manual and video links on the dedicated Org page is in my humble opinion not enough. Links to an FCOM is nice, but don’t forget, most simmers are not trained pilots and the FCOM is intended for trained and licensed Airbus pilots. Also the link to the simulated FMS is great, but it’s way too much information and many simmers are lost the moment they open the Acrobat file. There’s perhaps one note I found in the short manual that should be highlighted although I’m not 100 percent sure if the aircraft is still in beta. The current package version suggests that it is still in beta (0.8.79), but I could be wrong with that. I mentioned before that the provided Flight Factor URL has links to CCM Airlines (Compagnie Aérienne Corse Méditerranée Airlnies) manuals. By the way, CCM Airlines is the former name from todays Air Corsica. As far as my knowledge goes, Air Corsica only has A320-216 models with different engines then the simulated FF A320 CFM56-5B4. Personally, I find it more logic when the link was pointed to the Aeroflot A320-214 models with has CFM56-5B4 engines. 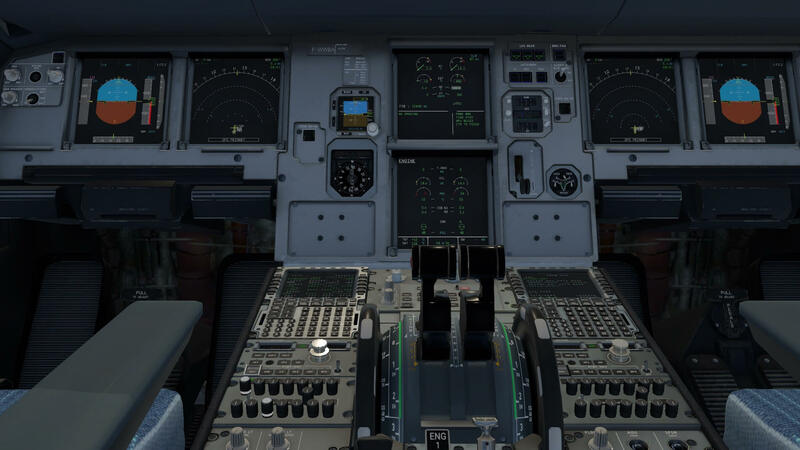 And this equals then the simulated FF A320 Ultimate! In case you prefer those Aeroflot FCOM manuals, then head to this URL. In case this URL doesn’t work, follow this link which brings you directly to the dedicated AVSIM.ru page. The name of the download suggests something else, but believe me, the package offers the FCOM volumes 1, 2, 3 and 4 as well as the QRH for all Aeroflot A320 Family aircraft. Ho ho, hold on …. all Aeroflot A320 Family members? I only need the pages related to the A320, right? In that case, at the bottom of each page you find some numbers. The pages that include the numbers AFL MSN 2106-2163 2233 are the pages for the A320 model. More information about this X-Plane 10.50+ and X-Plane 11 aircraft can be found at the dedicated X-Plane.Org store page. Is it worth the FF A320 Ultimate for X-Plane 11? It’s a lot of money, as of this writing April 2018 in total 89.95USD, so let’s be honest, very expensive. I won’t tell you or advice you if it is worth more then other A320 Family aircraft. 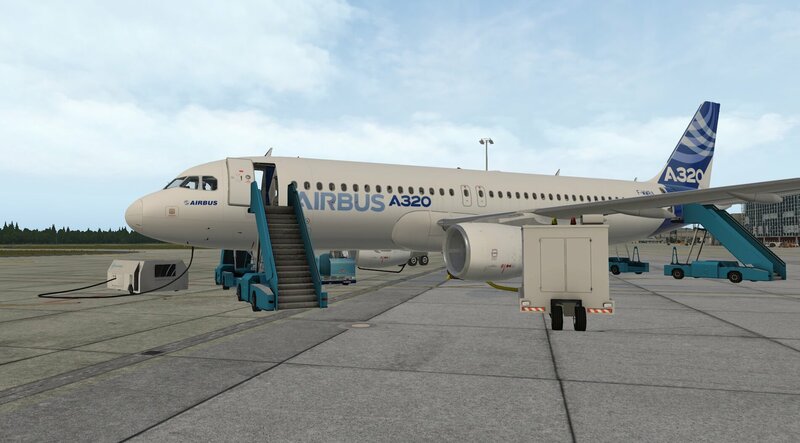 What I can say is that the only real compatitor at this moment is the ToLiss A319 from Torsten Liesk or, but it hasn’t been updated for a while, the JARDesign A320neo. 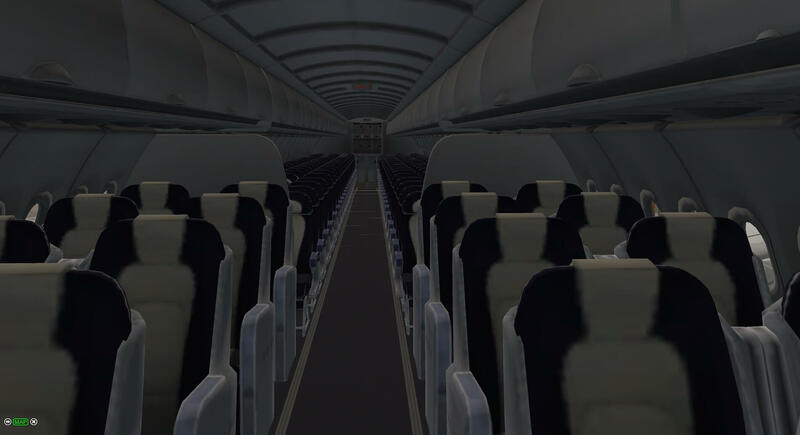 We all know QPAC, so we all know that the ToLiss A319 has this unique FBW plugin. 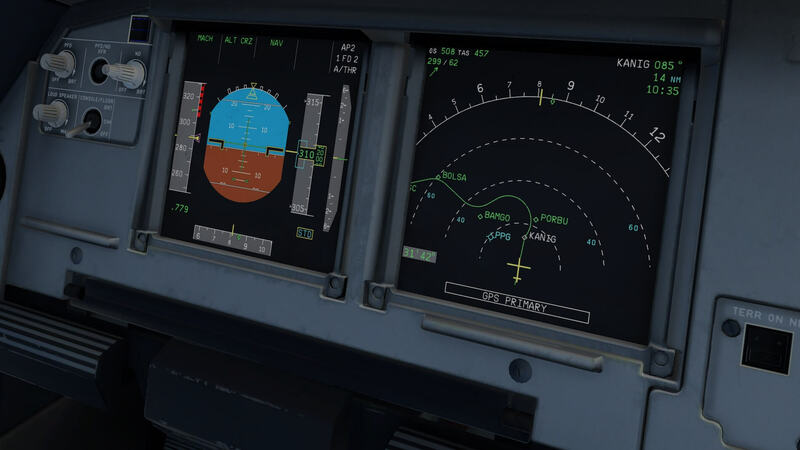 The ToLiss A319 does have a completely FMS too so actually, the ToLIss has a dedicated FMGS included. But this is not different for the FF A320 Ultimate. I don’t have often contact with Roman from Flight Factor, but via Skype he once informed me that his programmers have been working for years to simulate the FMGS. Oops, almost forgotten … the promised package with the corte.in file and some FCOM data. And did we cover everything of this A320 aircraft? We did our best, but for sure we’ve forgotten something. Any comment and/or suggestions are welcome. Therefore, feel free to leave a note what helps the community. 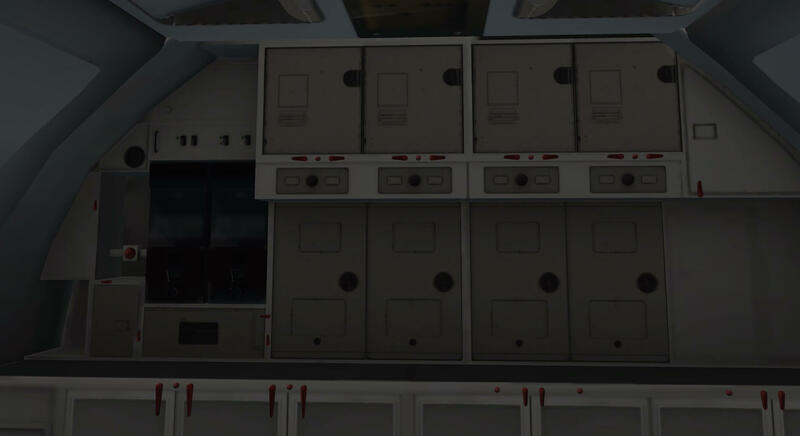 Besides the many uploaded liveries on a daily base, I also found this blueish blue cockpit textures. Interesting to be honest. Give it a try via this dedicated X-Plane.Org link. Hardware specifications (Andy): - iMac Intel i5 27"
Comments and/or suggestions are always welcome, but it seems you’re either an Airbus A320 licensed pilot which I doubt, or you’re always “in” for comments. Perhaps you should become a reviewer … a new challenge! Reviews by a user are one thing, but what separates THIS site from others is the amazing level of practical hands-on experience of the reviewers of the aircraft in question! Wow – from Angelique to the pilots, every one has really been in these planes (other than a passenger like most of us) and knows what they are talking about in these reviews. THANK YOU (MERCI) for taking the time to do these for the rest of us who wonder what real experienced people think and where we should spend our hear earned money on the next great X-Plane thing. Thank you John for your reply. Much appreciated. Absolutely fantastic review. The best site for unbiased in depth reviews in my opinion.